A description of the field artillery tactics and gunnery used by the Royal Artillery and the artilleries of British Commonwealth armies. It includes some organisational details, review and commentary. It has a linked glossary. This account briefly summarises the lessons of World War 1 and provides contextual information to help understand the British artillery. The artillery doctrine, procedures, main equipment and organisation used by the British were generally used by the artilleries in the Australian, Canadian, Indian, New Zealand and South African armies with only minor variations. This account uses the British terminology of the time; a linked Glossary defines many of these terms. For brevity some details have been simplified. The Technical Fire Control area of this site gives more detail about some specialised matters. The realities of each theatre, particularly the effects of terrain and climate, meant that artillery technical and tactical procedures had to be adapted to suit them. Furthermore, they evolved throughout the war with experience, the characteristics of the theatre, enemy tactics and with technology. Of course evolution was not always a smooth process, particularly if the right equipment wasn't available! This section provides background information as an introduction. It summarises the organisation of artillery, the artillery lessons of WW1 and outlines how mortars, anti-tank and anti-aircraft units were sometimes part of the field artillery. Detailed information, on separate pages, about guns is here, ammunition here, artillery organisation is here, and a full listing of all regiments can be found here. A brief description of the key feature of the British artillery system, that differentiates it from some other nations is here. Field Service Regulations established British Army doctrine - the principles for its organisation, administration, leadership and using its fighting power. Its emphasis was to ensure that the army could fight as an effective and efficient cohesive whole. Unlike some other armies British officer training never taught 'solutions' to battlefield 'problems'. Officers at all levels were taught to develop their own solutions and justify them, there were no 'book' answers. This means that those seeking predictive expositions of British tactics are doomed to failure, the catch-cry for tactics is 'it all depends on the situation'. However, the need to be effective, efficient and cohesive meant that there were defined procedures and even some battle drills, particularly for artillery which placed great emphasis on its ability to act fast. Furthermore, successful tactical techniques were promulgated for use in similar circumstances, but circumstances evolved throughout the war and varied between theatres. Nevertheless, training publications and 'lessons learned' meant that tactical 'patterns' existed, but there were choices and always scope for innovation and adaptation - flexibility was one of the British Principles of War. The Royal Regiment of Artillery (RA) in its modern form was created in 1924 by amalgamation of the Royal Field Artillery and the Royal Garrison Artillery. It is a regiment (a) of the British Army but embraces two smaller regiments, the Royal Horse Artillery (RHA) and the Honourable Artillery Company (HAC). There were also colonial regiments officered by RA officers with a small number of RA NCOs. During WW2 the RA comprised five 'categories' – field (including locating), anti-aircraft, anti-tank, coast and maritime. This account is concerned with the first, although the second, third and even the fourth undertook some field roles. These are described on the Other Firepower page. At the beginning of 1939 the regular and TA strength of the Royal Artillery totaled about 105,000. In mid 1943 the RA reached its peak strength, some 700,000 strong (about 26% of total British Army strength and about the same size as the Royal Navy), including about 5% officers, in some 630 regiments (b), 65 training regiments and six officer cadet training units. More details about strengths, recruiting and training are on the Recruiting and Training page. These included 130 regiments converted from TA infantry and yeomanry often retaining their previous regimental title as part of their artillery unit designation as well as badges and other accoutrements. However, the strength of the field branch (including anti-tank) in mid 1943 was about 232,000. The Regiment suffered some 31,000 killed during the course of the war. ‘Field’ meant 25-pdr, and 18/25-pdr, 18-pdr carriage with 75-mm, 18-pdr gun and 4.5-inch howitzer early in the war and a few self-propelled (SP)105-mm later. 'Army Field Regiments’ were field regiments that were not under divisional command. 'Jungle Field Regiments' in Burma had a mix of guns and mortars. ‘Mountain’, 'Pack' and ‘Light’ meant 3.7-inch or 75-mm howitzer, or mortars in a few cases. The howitzers were usually jeep towed but some were on animal transport. ‘Airlanding’ meant 75-mm (initially 3.7-inch howitzer). ‘Medium’ meant 5.5 or 4.5-inch gun (and 6-inch howitzer and 60-pdr gun initially, with the latter re-introduced in Burma in 1944). The shortage of medium artillery in 1941-2 led UK and Australia to acquire some US built French WW1 155-mm M1917/18 howitzers. ‘Heavy’ meant 7.2-inch howitzer and 155-mm gun (and 6-inch gun, 8 and 9.2-inch howitzer early in the war), although at the beginning of the war most coast artillery units were also called 'heavy' . ‘Super Heavy’ meant 8-inch gun, 240-mm howitzer, 9.2-inch railway gun and 12-inch howitzer. ‘Survey’ regiments contained survey, sound ranging and flash spotting elements. All British and Commonwealth field and anti-tank artillery regiments are listed here by type with information about their origins and deployment. Some other ‘odd’ designations were used from time to time, including 'assault field regiments' in UK and Burma in 1943-44, such regiments had at least some self-propelled (SP) guns, on D-Day Normandy only tracked vehicles were allowed across the beaches in the first 8 hours. There were also ‘observation’ and ’bombardment’ units that provided observation parties and liaison officers for naval gunfire and to airborne formations. The ‘golf bag’ principle was adopted to some extent in most theatres. The Royal Marines fielded assault gun regiments (using 95-mm SP howitzers) during the invasion of Normandy but had no other field artillery and unlike their enemies the British did not use infantry guns. At the end of the war independent radar batteries and divisional Counter Mortar Batteries were forming. Some field batteries in Burma were equipped with 3-inch mortars. Regiments and batteries were uniquely numbered within their designation, although a few regiments that changed type did not change their number, particularly if they were originally regular regiments. Most RHA and HAC batteries were uniquely lettered, although a few field regiments initially still had lettered (A - C) batteries, which had been the practice in territorial and war-formed units in WW1. Unique numbering was useful because batteries were liable to be detached from their parent regiments, sometimes for many months. Since the battery numbering system did not always make the precedence of batteries clear, for operational and technical purposes batteries were known as P, Q, R and S within a regiment. These letters were probably selected because they substituted for 'B' in the angle Observer - Battery - Target. This account follows British practice and uses ‘gun’ to mean both Guns and Howitzers. Apart from the ‘war formed’ regiments and those that converted from infantry and armour, the battery is the unit of tradition in the RA. Complete lists of British and Commonwealth field branch regiments are here. The British Army entered WW1 believing in the pre-eminent role of infantry whose moral qualities could overcome firepower. Artillery had an accessory role and paid lip service to indirect fire , although the 1906 doctrine had made it the primary mode of firing. They were not alone in this but very quickly changed their attitude. By early 1916 some senior artillery officers, notably Major Generals Herbert Uniacke and Noel Birch, had worked out how to use artillery effectively. The counter-battery battle had to be won, the barrage had to get the infantry onto their objectives and fire had to be available to defeat counter-attacks. By 1918 the 'all-arms' battle had become the recognised and practiced norm. Heavy preparatory bombardments were abandoned once tanks were available to smash barbed wire entanglements, bombardments had already proved ineffective in smashing well entrenched positions. Significantly and often overlooked was the recognition, from 1917 onwards, that in attack the key role of artillery was to neutralize with covering fire, not destroy, the enemy to enable the infantry to capture their objectives. This centrality of neutralization had also been recognised by Germany. By way of contrast as late as 1944 US doctrine stated 'In an attack of an organised position, the artillery must batter the enemy strength to the point of complete collapse before friendly infantry is committed to the assault.' (FM 6-20 Field Artillery Tactical Employment). The primacy of neutralization in the all-arms battle is a key to understanding British artillery methods. This technique, using a moving barrage, had been used in the Boer War on at least one occasion at the Tugela River in 1900. However, it had to be re-discovered. Technological advances for target acquisition (notably the low frequency microphone for sound ranging). Methods for predicted and or concentrated fire (needing gunnery supported by calibration, survey and meteorology). Training formation commanders and the infantry to trust and ‘lean-on’ the barrage (which also involved improving quality control in the new ammunition factories) and to plan and fight an all-arms battle. Training artillery commanders and staff at corps and divisional level to plan and deliver fire to meet the supported commanders’ needs while applying effective artillery methods. Organisational advances in artillery intelligence, counter-battery and non-divisional artillery. Process advances in counter-battery and barrage planning. In mid 1916 both the Royal Field Artillery and the Royal Garrison Artillery re-organised so that all batteries had 6 guns (less for the latter's very heaviest). The remaining problem was the technology of mobile communications between observers and guns. This was not solved until the arrival of portable radios after WW1, although radios were used for artillery communications in WW1, with continuous wave voice communications giving an indication of the future. By late 1918 the British had evolved the most sophisticated and capable artillery system in the world. After WW1, with the promise of no more major wars, artillery lapsed back to predominantly a battery focus, which was appropriate to imperial policing. However, while this may have been the day to day practice it was not the aspiration of the military leadership. They recognised the need to be able to fight a continental war against a 'first class' enemy. They also recognised that never again would they be allowed profligate use of men's lives and that they needed an army that was highly mobile with plenty of firepower. Their problem was lack of resources and low priority for the Army. However, the 1920's and '30's were the time of innovative thinking, most notably by the proponents of armoured warfare. This led to notions that armoured formations had little need for artillery and could rely on airpower. The idea of a war of movement also led to the view that there was little role for heavy artillery because of its relative immobility. The campaign in 1940 suggested that mobility was probably not a problem. However, it was also clear that aircraft were better suited to delivering area destructive fire against targets in depth. One consequence of this was that after the losses of 1940, the fighting in the Western Desert was characterised by a shortage of artillery, particularly of medium and heavy guns, that continued until after El Alamein in late 1942. Cooperation with the supported arm - infantry or armour. Economy of firepower - particularly reflected in the use of neutralisation and the ability to concentrate. Mobility of firepower - the ability to concentrate firepower when and where it was needed without re-deploying the guns. formation, etc, commanders should not have to deal with more than one artillery commander (who was responsible for field, anti-tank and anti-aircraft artillery). ‘In Support’, which made firepower available, potentially all guns within range, and enabled firing across divisional and higher formation boundaries. The British Army did not recognise the principle of Unity of Command in the way that other armies did, instead they subscribed to Unity of Effort, a more flexible concept. The consequence of these simple arrangements was highly flexible mobile firepower that could be provided where and when it was needed. 'Under Command' meant that control was centralised under the commander, while 'In Support' meant decentralisation. From late 1942 there were in effect only two levels of command with organic field artillery - division (divisional field regiments) and army (all other field, medium and heavy regiments). Typically a regiment 'under command' of a division would be 'in support' to a particular brigade, but this did not prevent it firing in support of formations to its flanks. Corps became the primary level of artillery control for counter-battery action (as it was in WW1) and in the final year of the war for major offensive fireplans. Control was usually centralised for defensive and major attack operations and decentralised for an advance. However it was rare for command to be decentralised below divisional level and decentralisation mostly applied to the army artillery being assigned to corps or division level. For more information see the 'Command & Control' page. From early in the 20th century the basic organisation of the artillery was a divisional artillery comprising 2 to 4 units, called 'field brigades'. These brigades had sub-units called 'batteries', which in turn were split into 'sections' each of 2 guns. After WW1 there were additional field, medium and heavy brigades above divisional level . However, in 1938 the field brigades were renamed regiments, lost their survey sections and reorganised in two batteries of guns, regimental HQ was significantly increased in size including gaining a second in command. The batteries were reorganised with sections being grouped into 'troops'. Each field battery of 12 guns was organised as three troops (except RHA batteries that had eight guns in two troops) and medium brigades became regiments of 2 batteries. The Commonwealth armies followed suit, in some cases not until early 1940. The field regiments changed again after 1940 as the lessons of the campaign in France were absorbed. Each troop had a command post (CP) as did the battery. Troops were sequentially lettered within a regiment and divided into two sections (left and right) each of two guns. Guns being called ‘sub-sections’ and sequentially lettered within the battery. In consequence guns were colloquially called ‘subs’. For more detail about organisations see the 'Artillery Organisations' page. That artillery commanders and tactical commanders must be co-located at all levels of command. That artillery command must be well forward. That artillery command and control must be directly linked to the all-arms tactical plan. It had many important consequences, not the least of which was that the artillery commanders, from troop level upwards, spoke authoritatively to the supported commanders and gave orders, not requests, to the guns. It also eliminated the risk of the artillery conducting their own private war controlled from the rear. In 1941 General Montgomery, as chief umpire on Exercise BUMPER, stated 'The business of the Gunner Commanding Officer is first to train his regiment and then to train the infantry and armoured brigadiers to use it properly'. The regiment's second-in-command was responsible for its gun area. Regimental HQ (RHQ) was there and operated by the adjutant. The senior officer on each battery position was the (battery) Captain (BK), who had particular responsibilities for administration and was not involved in firing the guns. There was a command post officer (CPO) in the battery CP (BCP) and a gun position officer (GPO) at each troop CP (TCP) all with an officer assisting. The CPO was responsible for the overall gun position including its gunnery and local defence. Mid-war a new role - Section Commander (or section officer) - was introduced. This was an officer, warrant officer or NCO appointed by each GPO to supervise each section in the troop in addition to their other duties, it was a role and there was no change in establishment. Medium regiments always had two medium batteries, each with eight guns. Heavy regiments had batteries of four guns, which were not organised into troops so they had only one CP. After Dunkirk they had four batteries with 7.2-inch howitzers as these became available. In 1943 155-mm M1 guns replaced 7.2-inch in two of these batteries and in early 1945 the 7.2-inch started converting to the longer range Mk 6 on the M1 carriage. Super heavy batteries had two guns, with three batteries in each mixed regiment. The various mountain and light batteries varied from four to eight howitzers, and mortar batteries generally had 16 tubes. With the exception of the heavies, regiments usually had a single type of gun. However, in Burma after 1942 mixed equipment regiments were common. In 1944 in Burma anti-tank regiments became dual equipped, each detachment had an anti-tank gun and a 3-inch mortar (12 per battery). Most field regiments were under command of the divisional artillery commanders, the CRA, a brigadier. All divisions and corps had their own HQRA, with both command and control roles. At divisional level this small HQ had 3 staff officers as well as the CRA. Above corps level HQs had an artillery staff branch, usually headed by a brigadier (BRA) at army or command and major general (MGRA) at army group or major command level, with advisory and command roles to and through the Commander and general staff. Initially there was a second HQRA at corps under command of the CCMA who commanded the corps medium artillery and any GHQ field, medium and heavy regiments allocated to the corps, this position was abolished for inexplicable reasons in 1941. The basic scale for a corps artillery, not always achieved, being two army field regiments, two medium regiments and a survey regiment as corps troops. In France in 1940 GHQ had an additional 19 regiments, half of them medium. This gave the BEF (11 divisions in 3 corps) 60 regiments totaling 1280 guns. The British Liberation Army that returned to France in 1944 had 11 divisions (including 3 armoured plus many independent tank and armoured brigades, but excluding Canadian, Polish, Belgian and Dutch formations) in 4 corps with over 65 regiments, of which 30 were in divisional artilleries. From September 1942 AGRAs were formed as 'army troops' with heavy, medium and field regiments, they provided organisation for the regiments under army command. An ad hoc medium artillery group was used at El Alamein under command of a regimental commander and several months previously at Bardia. The creation of AGRAs meant that corps field artillery was reduced to a survey regiment but an AGRA nominally comprised a corps' scale of army artillery. From late 1943 (after the conversion of some field regiments to medium) the scale of two field, one medium and one heavy regiment per corps increased to one field regiment, one medium regiment plus one medium regiment per division supported and one heavy regiment. The AGRAs were under army command and assigned to corps as required, normally one to each corps. Nevertheless for major operations a corps might get additional AGRAs, and sometimes they were allocated to a division and sometimes additional field and medium regiments were allocated to a division for an extended period. However, it was not British practice to routinely distribute non-divisional artillery regiments among divisions because this conflicted with the principle of centralised control. Initially AGRAs were without a signal company. As the war progressed their roles increased, particularly in counter-battery. Survey regiments remained at one per corps and were not part of an AGRA. Some army field regiments became semi-permanently attached to independent armoured and tank brigades. There were quite a lot of these. For example at El Alamein there were 3 armoured divisions, each established with a single armoured brigade (plus a motorised infantry brigade). However, there were actually 8 tank and armoured brigades present. These independent tank and armoured brigades were assigned to infantry divisions as necessary, although sometimes they reinforced armoured divisions. In either case they often had to be provided with supporting artillery. Regiments that were not in corps or divisional artilleries or AGRAs were under theatre command and allocated to 'Under Command' of other formations as required. Some of these regiments were War Office (WO) Reserve or WO Pool. Reserve regiments were for emergencies and could not be allocated without WO authority, pool regiments were allocated as required by the theatre HQ but could revert to WO authority. By early 1945 in NW Europe 21st Army Group (6 corps) had 7 British and 2 Canadian AGRAs. The largest AGRA was 1st Canadian in Italy that reached 10 regiments (mostly British), but most were about 6 regiments, while the smallest was a super-heavy AGRA with 2 regiments. Although AGRAs were formed in India, there were never any in Burma and only one in the final months of theNorth African campaign (1st AGRA, in action with 19 French Corps in January 1943). Some army field regiments were converted to medium and heavy regiments as guns became available, and HAA regiments in the ground role were also allocated to AGRAs as the air threat decreased. The divisional artillery comprised field regiments. Three regiments in infantry divisions and eventually 2 (one self-propelled) in armoured divisions. However, forward infantry divisions in an advance were usually allocated a total of four field and two medium regiments, totaling 128 guns. The additional regiments usually came from AGRAs. In NW Europe heavy and HAA batteries were also routinely allocated to divisions for counter-mortar tasks. The 1939 War Establishments were found to lack manpower and in May 1940 revisions were approved but never implemented. In October 1940 field regiments were reorganised into three batteries each with eight guns (two troops) and their survey sections re-formed. This change did not happen instantly everywhere and the new organisation for a battery was not finalised until well into 1941 although the proposed organisation and procedures were promulgated in January 1941. Minor changes continued throughout the war. The changeover took two forms, some regiments changed to 2 batteries of 8 guns while others changed to 3 batteries each with a single gun troop of 6 guns. The reorganisation to regiments of 24 guns was not completed until well into 1943 because it took some time to produce all the required NCOs and specialists, particularly for regiments overseas. At El Alamein in late 1942 10 of the 39 field regiments still had only 2 batteries. The new organisation increased the number of vehicles and signalers. In 1943 establishments were standardised army wide so that similar numbers and ranks were authorised for similar tasks. By the end of 1943 a towed field battery's war establishment strength was 198 including 10 officers and an SP battery's was 186, again with 10 officers. Medium batteries (4.5/5.5-inch) were bigger, 252 (still 10 officers), because their gun detachments were larger. Heavy batteries were only 166 with 6 officers. These large batteries enabled sustained 24 hour operations. It also proved a boon in Burma for local defence against ground attack. Full information on given on the 'Artillery Organisations' page. An RA regiment comprised several elements from the establishment perspective. By 1943 these were the regiment itself, mostly RA cap badge, but included attached cooks (from the new Army Catering Corps by this time), a medical officer, and tradesmen from the Royal Electrical and Mechanical Engineers (REME). Then there was the signal section from Royal Signals, with its own officer and finally the Light Aid Detachment (LAD) from REME, about 13 strong. The RA soldiers were divided into Tradesmen and Non-Tradesmen. The former included driver-operators (signalers), driver-mechanics, gun fitters, vehicle- mechanics, equipment repairers, clerks, storemen and the 'Battery Surveyors' in the regimental survey section. By number the main non-tradesmen were gun numbers, drivers IC and signalers. The final element in the regiment were the 'First Reinforcements' who replaced RA battle casualties. They included officers, NCOs and gunners, including tradesmen, and in a field regiment totaled 54 including 5 officers. The regimental headquarters was some 88 strong including 9 officers, this figure includes the regiment’s LAD and signal section as well as the 10 strong survey section with its officer. The 8 gun field battery included four defence teams equipped with an AAMG (LMG) and ATk rifle. However, initially only about 30% of the battery had personal weapons, although this changed to 100% in early 1943. The official scale was a pistol per officer, a machine carbine for Warrant Officers, drivers and motor cyclists, and members of LMG detachments. The rest carried rifles. In mid 1943 20-mm AA guns were approved for all arms, with mountings capable of firing on the move and issued to towed artillery regiments, and PIATs started replacing ATk rifles. However, the extent to which 20-mm AA guns were issued is unclear. The totals for a field regiment were 25 × LMGs, 13 × PIATs and 8 × 20-mm. A 1941 25-pdr field battery had 12 motorcycles and 38 other vehicles of which five were for cable laying. By 1944 the number of motor-cycles had decreased to 7 and 4 jeeps ('Car, 5-cwt, 4 × 4' in British terminology) had appeared, to total 46 vehicles and motor-cycles. In August 1941 the first Air OP (AOP) Squadron formed, these had light aircraft (Austers) with artillery officers as observer-pilots, eventually there was a squadron per corps (except in Burma), normally providing a flight of four aircraft to each forward division and AGRA. These squadrons first flew operationally in Tunisia. Each aircraft ('section') with its RA pilot and mixed RA/RAF ground crew could deploy independently. The engagement of targets found by other RAF aircraft, the Arty/R procedure, established in WW1, continued although its extent was far less than had been hoped for and close to negligible in some theatres. AOPs could engage targets on clear moonlight nights and developed an air photo capability and also directed naval gunfire. In the SW Pacific Australia did not create an AOP organisation and relied entirely on 'army cooperation' aircraft of the RAAF. Canada (initially), New Zealand and South Africa did not create AOPs either and their formations were supported by British squadrons. More details are in 'Other Firepower'. Just as, if not, more significant in 1941, was a ‘bottom up’ tactical innovation that emerged in the surrounded town of Tobruk on the Libyan coast between Australian infantry and British artillery – close affiliation between a battalion and its supporting battery. This relationship spread rapidly throughout the British and like-minded armies. It was the critical element for a harmonious and trusting relationship between artillery and the supported arm, and the forward presence of the battery's senior officers was probably its key. With it came guaranteed fire support because the observers could order targets to their battery. However, it did raise a problem in that the supported arm tended to view the battery as ‘theirs’, often failing to recognise that artillery fought at both the tactical and operational level, and the implications of ‘In Support’ and mobile firepower. The main problem was four companies in a battalion but only two observers in a battery, so the latter often had to move between companies in battle. This could be a problem, particularly in Burma, where it was found that a battery had to deploy up to five observation parties. This was initially achieved by rotating gun-end officers and soldiers through the additional observation parties but the establishment was changed to provide the extra parties. Close affiliations developed between brigades and their supporting regiments. The regimental commander (CO) increasingly accompanied the supported brigade commander wherever he went and by late 1943 this became official artillery policy, with the CO establishing a small HQ at brigade HQ (a policy first established in 1918). In regiments without a directly supporting role to, or under command of, a brigade the CO was based at regimental main HQ in the area of his battery gun positions. BCs mirrored this with the battalions and regiments they supported. As the war wore on the field role of anti-aircraft and anti-tank batteries increased because their specific targets decreased. The former often provided a significant component of major fire plans and HAA batteries (3.7-inch guns) were increasingly used against opportunity targets. The main reason that HAA were not used more extensively in the field role was that they were not officially authorised to have the necessary technical fire control equipment until late 1944. The gunnery staff was responsible for instruction at artillery schools in UK and overseas theatres, which greatly facilitated in-theatre regiments' re-equipment. They also wrote most of the wide variety of artillery training publications having designed and developed the drills and procedures and many of the instruments. However, their most visible role was at practice camps, where they critiqued the gunnery and its compliance with official procedures and reported on each unit’s performance. The result of this quality control system, after late-1941 or so on completion of expansion and re-organisation, was a high standard of uniform gunnery throughout the RA and a body of men with a deep understanding of it. Well designed drills were the optimum way of carrying out a task, taking into account speed, mistake prevention and integration with other procedures. Drills facilitated training by enabling skills to be properly defined. Drills helped soldiers carry out their tasks under adverse and stressful conditions. Almost all artillery drills involved two or more soldiers, this was part of the goal of having everything double-checked to prevent errors. A characteristic of the British artillery system was great tactical flexibility by having units’ senior officers forward, underpinned by well honed standard drills and uniform procedures for gunnery that enabled junior officers to run gun positions. Unless a battery was operating independently, the CO selected the gun area in consultation with the supported brigade staff and HQRA. BCs were given a target zone for their battery, which reflected the needs of the battalion they were supporting, if this was forward. The BC selected a central point in this, which enabled him to designate the battery zero line. A regimental zero line could be used until 1941, and was briefly mandatory. This was the rough bearing from the battery to the target zone centre. Terrain permitting, the batteries of a regiment normally deployed within 1,000 – 2,000 yards of each other. The main reason for this closeness was speed of survey, ease of communications and ammunition supply, and typical brigade frontages. An example of the format of deployment orders is here. During deployment the regiment and batteries operated as several tactical groups that provided reconnaissance (G Party) and preparation (battery HQ party) of the next positions in readiness for the main bodies comprising the gun and ammunition groups, and B echelon. These parties can be seen in the unit details linked to the 'Artillery Organisations' page. See Figure 2, within batteries the troops normally deployed a few hundred yards apart, with the right hand gun the pivot gun. This meant that a field regiment presented six separate gun positions as targets for CB fire. The guns in a troop normally deployed about 20 - 30 yards apart, initially in a straight line but a more curved pattern after 1941, mainly to enable better anti-tank defence. In Burma the terrain often meant that gun positions were extremely tight, perhaps 500 × 200 yards for a regiment and these tight perimeters aided local defence in a theatre where ground attacks on gun positions were the normal Japanese counter-battery method. Gun positions in Burma often resembled the 'Fire Support Bases' used a generation later in another South East Asian theatre, and in early 1945 a bulldozer was added to each battery. Local defence arrangements became well developed, at night camouflage nets were removed from gun pits and only one man remained in a gun pit unless 'take post' had been ordered, gun pits were the primary target of Japanese hand grenades. The usual practice at night was that only LMGs fired and then on fixed lines along wire entanglements, the close battle was fought with grenades and bayonets - the tactics that had emerged in the trenches of WW1. The only VC awarded to an artillery NCO in WW2 was to Havildar Umrao Singh of 33rd Indian Mountain Battery when defending his gun in Burma. Each TCP was connected by line to their troop commander (observer), to each other and to the BCP, which in turn connected to the BC, the other batteries’ CPs and regimental HQ. Sometimes these links were further duplicated to give redundancy, and at the beginning of the war visual signaling was still used occasionally, for example in North East Africa. Radios connected the main elements of the battery, and RHQ, from the beginning of the war. It became increasingly important as radios and operating skills improved, and line was used less. It became a matter of pride that artillery communications were always available and when supported arm communications failed they relied on artillery communications. For more detail see the 'Artillery Communications' page. Observation posts (OPs) were usually selected by the BC to provide observation throughout the battery’s zone. However, this selection usually had to be balanced by being in or close to a forward company area. The OPOs then silently registered their zones of observation by visualising the zero line and possible target areas in relation to it. Sometimes the zone would be registered by firing. Time permitting, observers would produce a panorama drawing of their zone highlighting reference points, the key features and data for them, and any registered targets. Originally silent registration had involved instruments such as directors and optical range finders so that the location of potential targets could be determined with maximum accuracy by the OP, this being the pre-1938 practice when the BC was a battery's only observer. However, as the war progressed this gave way to OPOs 'map spotting' the likely target locations. The GPOs, normally directed by the CPO (who was the battery deployment officer and selected the troop positions) selected individual gun 'platforms'. The CPO was directed by the regimental second-in-command and received the zero line from his BC. They had to cover the ordered zone of fire (which meant avoiding close or high crests). An ideal position would have a low crest about 500 yards in front of it, this clear field of fire was in case they came under tank attack and the crest provided some cover from flash spotting. The usual practice at the beginning of the war was to deploy a troop in a straight line at right angles to its zero line, mainly because this simplified the gunnery. However, defensive actions against tanks in N Africa highlighted the problem with this; if tanks could attack from a flank anti-tank firepower could be limited to a single gun. This led to troops using a curved layout. In practice layout varied with circumstances, notably the terrain and threat from air attack or CB fire and if the terrain was difficult the layout could be in any shape to accommodate the guns. Increased emphasis on camouflage and concealment after 1940 led to avoiding 'standard' layouts because this compromised concealment. The TCP was positioned to the upwind flank. The BCP and battery director were positioned somewhere between the troops. All vehicles were sent to the wagon lines some hundreds of yards away from the guns and there were strict track plans as part of the battery’s concealment measures. In action the guns of each troop were numbered from the right, the pivot gun usually being Number 1. Each gun usually ended up with a different number on each position, the sub-section letters were not used for gunnery. A battery did not deploy onto a new gun position as a whole, the CPO and GPOs went ahead to prepare the new position by laying it out and being able to orient the guns the moment they arrived. From the time the guns left a RV about one mile from the new position they were expected to be ready to fire in 15 minutes, more at night. Of course this would usually be only the lowest state of survey and minimal line laying. Sometimes the two troops would move separately (‘step-up’) so that one was always in action. Roving troops or sections and ‘pistol guns’ were sometimes used for registration tasks, deception, ‘sniping’ and precision (destruction) shoots. On coming into action a troop was oriented in the zero line by their GPO using the troop director, either by individual bearings from the director or through a distant aiming point and corrections for relative position. Troop directors were oriented from the battery director. Fore more detail see the 'WW2 Fire Control' and 'Laying & Orienting the Guns' pages. ‘Quick actions’, where guns came into action on an unprepared position in response to a call for fire during a move were used. The time from a call to being ready was about 8 minutes. This technique was quite widely used in the desert. As the war progressed, it became more normal for another regiment (not moving) to join the moving regiment’s radio net and so be able to quickly respond to calls for fire. British doctrine was to select and prepare an alternative position for every gun position occupied. This position would be several hundred yards from the primary position. The minimum level of preparation was to select gun platforms, fix the pivot gun positions and plot them on the artillery boards at the main position, and reconnoitre the route between main and alternate positions. A GPO could request permission to move his troop to the alternative position from the battery's CPO, who was normally required to obtain permission from the Adjutant at RHQ. Of course in theatres such as SE Asia the terrain sometimes did not provide space for alternative positions. Furthermore it's likely that in the final stages of the war, where the enemy CB threat was negligible, batteries did not bother about preparing alternative positions. Camouflage and concealment from ground and air observation were given high priority, at least until the air threat faded with allied air superiority. Deception measures were also used for major operations. A variety of camouflage equipment was available to units and for major operations ordnance and engineer parks could provide or produce additional items. Local material was, of course, widely used. In early 1943 disruptive painting patterns for vehicles became policy although counter-shading paint schemes had been used well before this. Two types of camouflage nets were used 'fish nets' with a mesh of about 2-inches were garnished with strips of suitable colours using flat strips or knots, in various densities over the net. Nets came in several standard sizes and could be tied together. The garnish could be altered to suit the local terrain. Shrimp nets had a fine mesh and were used without garnish, mostly with armoured vehicles. In addition hessian sheets were available, and were painted as necessary and could have garnish knots applied. Painted wire wool was also used. Each gun had an entitlement to 5 fish nets and metal frames to support them, these gave cover for the gun and its ammunition, it provided a 25-pdr with 2465 square feet of net and a 5.5-inch 3605 square feet. Vehicles had 2 nets and OPs and CPs 1 each. Guns could also have irregular shaped screens, usually painted and garnished hessian, that were fitted to the shield and free-standing side screens of similar construction. The former being called 'gun cosies'. A key element of British deployment was to avoid standard regular layouts for batteries, guns were individually sited according to the cover and scope for concealment offered by the terrain against air and or ground observation. Track-plans were also a vital element in concealing a battery and deceiving hostile reconnaissance, all vehicles moving about the position had to follow designated tracks that were concealed from or looked 'natural' to air observation. Drivers who ignored this were liable to a memorable and one way 'discussion' with the battery sergeant major. Imperial and expeditionary operations and invariably external lines of communication had given the British Army a keen appreciation of administrative issues. Artillery ammunition is a major logistic load in any army. The basic method was to use rail transport as far forward as possible (not far into Burma!) and then vehicles from the railhead. The British Army dealt in First Line and Second Line ammunition holdings. First Line were held in and moved by the unit. Second Line was held on wheels by Army Service Corps (ASC) ammunition companies (later multi-function transport companies) organised in divisional columns (ie battalions). The Second Line ammunition scale was basically a transport platoon's worth per artillery regiment. Each AGRA also had their own ASC company and there were ASC units supporting the artillery under army, army group or GHQ command. However, for major fire plans ASC vehicles would dump ammunition to the gun position where it would usually be dug in. As a rule of thumb about 200 rounds per gun of 25-pdr ammunition could be dumped in a night. The definition of dumped ammunition was that it was more than could be carried in artillery units’ vehicles. The British did not use Daily Ammunition Expenditure Rates as a means of control. The ammunition supply system was designed to 'pull' forward the amount needed to maintain batteries with their First Line entitlement. However, daily expenditure was sometimes limited, either due to supply shortages or when building up stocks for a major offensive. In 1940 a field battery’s total First Line ammunition load was 1080 rounds. It was subsequently increased to 1376 for both towed and SP batteries giving each gun 114 HE, 16 smoke and 12 armour piercing, this evolved as further ammunition varieties became available. In N Africa in 1942 more smoke was carried because of its usefulness in neutralising anti-tank guns. Each 25-pdr section (two guns) had three gun tractors and four ammunition trailers (often called ‘limbers’) carrying a total of 224 rounds, and at least one trailer deployed with each gun, at least until gun pits had been dug and the ammunition in the tractor was off-loaded. 25-pdr SP batteries carried 75 shells and 18 armour-piercing shot, and 96 cartridges on each gun and a further 64 in a section half-track. An interesting expedient on D-Day was for the 105-mm SPs to tow a 'Porpoise', a sealed and floating 'sledge' containing extra ammunition, their on-board load of 69 rounds being less than 25-pdr SPs due to the length of the 105-mm M1 round. This was supplied packed as a single complete round, two rounds per box in contrast 25-pdr ammunition came in boxes each containing four fuzed shells or eight cartridges, the latter being in a sealed can. After 1940 medium batteries carried 800 rounds at first line, 40 rounds on each gun tractor and the remainder in the battery ammunition vehicles. Heavy batteries (7.2-inch) carried 56 rounds per gun or 80 rounds per 155-mm. These were carried on the gun tractors, 2nd gun tractors and a 3-ton truck per gun. British doctrine was to remove all vehicles from the gun position so only ammunition trailers remained close to the guns, this meant that ammunition had to be unloaded from other vehicles. However, the quantity depended on the tactical situation. Medium and heavy shells were delivered ‘plugged’, fuzes were provided separately in boxes of 20 and had to be fitted before shells could be fired. Field shells were delivered boxed and fuzed, percussion fuzes in the case of HE. All HE shells were painted a sand colour. If HE airburst or delay effects were require the percussion fuzes were removed, using a fuze key (basically a spanner or wrench), and the other fitted. Ammunition trailers carried ammunition that had been unpacked, which meant that ready-to-use ammunition was immediately available and didn’t have to be re-packed when guns moved. For more details and illustrations see the 'Ammunition' page. There were no ammunition vehicles at regimental level. However, regimental commanders could centralize some of their batteries’ ammunition vehicles to provide a centralized mobile reserve. Re-supply was usually by collection by battery vehicles from an Ammunition Point (AP) - the Second Line stocks, usually within very few miles of the gun areas. APs were operated by the ASC ammunition or transport companies, which in turn usually collected ammunition from ASC third line transport companies delivering from railhead to an Ammunition Refilling Point. Artillery creates quite a lot of salvage with its empty ammunition packaging and cartridge cases, the latter being brass were quite valuable and recyclable. Units were supposed to centralise their salvage so that it could be recovered by corps salvage companies. To put all this into perspective 11 Armd Div's ammunition expenditure in NW Europe 1944-5 provides a snapshot. Their 247 tanks averaged less that 5 rounds per tank per week, while their 48 25-pdrs averaged over 235 rounds per gun per week! This also highlights the capability of indirect firepower over direct fire. Each battery had its own fitters and mechanics and these together with the Battery Quartermaster Sergeant and his storemen and cooks, the ammunition group and the battery office operated in the battery wagon lines. The Battery Sergeant Major was responsible for the wagon lines, although before the 1940 re-organisation there was a wagon lines officer. The battery captain was responsible for the battery's local administration. The battery's fitters and mechanics, who were artillery, and its LAD carried out First Line Repairs. However, they always moved with the battery so this limited the amount they could do. The LAD, which included a recovery vehicle, could undertake repairs that took a bit longer. In both cases they fitted spares or replaced assemblies, providing they had the means to lift them. Divisional and Corps (for non-divisional units) mobile workshops undertook Second Line Repairs, that needed more time or specialised equipment and skills, this included repairing assemblies. Semi-static workshops in the Line of Communication could repair or rebuild most things. Signals equipment was repaired by division or corps signals regiments. Food for the battery area was usually prepared and distributed under battery arrangements. Normally a regiment carried the current day's rations and the next day's rations were in ASC second line transport. In addition every man carried an 'iron ration' for emergency use. At regimental level there was the regiment’s B Echelon under the command of the Quartermaster. Unit B Echelons were often grouped together under brigade or divisional arrangements. The LAD was usually located with the B Echelon. Each troop commander (and BC) had an OP assistant, usually a bombardier although the BC's might be a lance sergeant. By 1942 each party had three radios, one fully integrated in their vehicle, one for FOO manpack and one on the supported infantry or armour net. The last improved situational awareness and enabled the supported arm to indicate targets to a FOO/OPO. If the observer was unable to see the target then the supported arm directed fire via the observer using simplified procedures (giving either corrections or observations). A third observer party could be deployed from resources at the gun position if the battery was up strength. If a troop commander was required to act as an FOO or liaise with the supported arm then the OP assistant would takeover, inevitably this also happened when observers became casualties. In Burma additional observer parties were created often led by warrant officers or sergeants from the battery and it was general practice to rotate officers and soldiers through the battery's OPs when conditions were static, although signalers were rotated more often. In some cases in Burma OP deployment was planned regimentally to ensure optimum coverage in difficult terrain. Observe and report the tactical situation. Maintain close contact with the supported arm and give required support at the earliest moment. Direct and control the fire of the allotted guns, from 1942 some observers were authorised to order fire to all batteries in their regiment, division or corps but all could always request it. In most types of regiment BCs and troop commanders had an armoured tracked vehicle, the Universal Carrier (Lloyd or Windsor carrier) called an 'Armoured OP' in field batteries. COs in field regiments were equipped with Universal Carriers from mid 1943. However, these Armoured OPs were less than ideal so other armoured vehicles were adopted. SP regiments:- CO - Tank OP 3 wireless sets, BCs - Truck, 15-cwt, half-track with 2 wireless sets, Tp Comds - Tank OP 3 wireless sets, GPOs - Tank OP 3 wireless sets (total 13 OP tanks). Field or RHA Regiments:- BCs - Armd OP 2 wireless sets (Armd Div) or Lt Tank OP 3 wireless sets (Inf Div), Tp Comds - Tank OP 3 wireless sets (Armd Div) or Armd OP 2 wireless sets (Inf Div). A BCs Lt Tk OP could be a Tank OP as an alterative and in Italy one of the Armd OPs would be an armd car. Medium regiments:- BCs - Lt Tank OP 3 wireless sets, Tp Comds - Armd OP 1 wireless set or Armd Car 1 wireless set. Heavy regiment:- BCs - Armd OP 2 wireless sets or Armd Car, Subaltern - Armd OP 2 wireless sets. In mid 1944 the policy changed again with the decision to remove all heavy AFVs from infantry divisions. SP regiments retained their 13 OP tanks and the other field regiment in an armoured division had 6 for its OPs. They were withdrawn from all other units although Armoured and Tank Brigades held 8 OP tanks. The basic policy was that OP tanks should be the same type as used by the supported tank unit. However, the policy could not always be followed and in some cases Ram tanks were used (a Canadian design used as the carriage for Sexton SPs but not as a tank in armoured units). Radios were standardised as 2 × No 19 sets and 1 × No 38 set per OP tank and stowage modified for some artillery equipment. In some cases (eg Covenanter, Crusader and Ram) a dummy gun was fitted to permit space for the wirelesses. Apart from dummy guns, the differences between OP tanks and standard control tanks was an additional wireless and stowage for other OP equipment. The tanks held by Armoured and Tank Brigade HQs were a pool for use by regiments in support (or allocated under command) of these formations. They had RAC crews who were joined by an OP officer and his OPA, unlike the tanks held by RA regiments that were fully crewed by RA (usually the OPO, his OPA, a driver-operator and a driver-mechanic). Armoured divisions also held an OP tank for their CRA. The tanks for GPOs also provided immediate replacements for OPs. The observers’ basic equipment were binoculars, map, compass and protractor. Manpack OPs became important in some theatres, this was achieved by reinforcing the normal 4 man OP party with 6 'porters' to help carry the 2 wirelesses and associated equipment. Batteries also held telescopes, tripod mounted stereoscopic binoculars, optical range finders, directors and artillery boards for their OPs, the last 3 to enable 'silent' or 'instrumental' registration. However, such equipment was not always conducive to a well concealed OP and certainly inappropriate for an FOO. The Telescope, Stereoscopic, was tripod mounted (full size or 16 inch) with azimuth and inclination scales and gave ×8 magnification, it was binocular and the binocular tubes could be either vertical to provide a short periscope or horizontal to give enhanced stereoscopic vision. Signalers and GPO/CPO assistants staffed the CPs in the various types of battery. There were 8 CPO/GPO assistants in a battery. They were non-tradesman specialists trained in CP procedures, some were NCOs up to lance sergeant. For most of the war they had 15-cwt trucks but SP batteries had half-tracks for their battery and troop staff (apart from the GPOs with their OP tanks) and some batteries used a fitted for wireless version of the 'Quad' gun tractor. Towards the end of the war GPOs in SP batteries replaced their tanks with armoured CP vehicles, these were the Canadian Ram carriages (used for Sexton 25-pdr SP and as APCs where they were called Kangaroos). No 2 - 21 inches square with a range arm to 12,000 yards and 60° arc at 1:25,000 scale. No 3 - 30 inches square with a range arm to 16,000 yards and 70° arc at 1:25,000 scale. Range Tables – provided ballistic data about the gun and for corrections for non-standard conditions. Correction of the Moment – calculated using data from a meteor telegram and locally read charge temperature then graphed. Sands Graph – enabled individual position corrections and deflections for displacement of each gun from the pivot gun when lines of fire were not to be parallel. Range Tables Part 2 and slide rule could also used for this. 4 Figure Logarithm Tables, in Range Tables Part 2 – for some calculations when accuracy took precedence over speed. Slide rule, 'RA 10 inch' – for various calculations and interpolation of data. Charts for crest clearance, angle of sight, standard barrages, etc in Range Tables Part 2. Proformas and official Army Forms for various calculations and records. Troop CPs had items for link shooting. More details are given on the 'WW2 Fire Control' page. Each gun was commanded by its “Number 1”, a sergeant, this designation being from the formal gun drill that gave a number to each role in a gun detachment. 25-pdr detachments were 6 strong, those for medium guns 10, and 13 for heavy guns. For a 25-pdr No 2 operated the breach, No 3 laid (UK guns used one-man laying), No 4 loaded and Nos 5 & 6 handled ammunition. Reduced detachment drills enabled a 25-pdr to be fired with 4 men. Detachment members were cross-trained in the different roles, basic gun drills taught all roles to all. One of them, usually a bombardier (or lance sergeant), was ‘coverer’ - the No 1’s deputy and another was usually appointed ‘limber-gunner’ and responsible for carrying out routine maintenance. Apart from some US origin guns that used panoramic telescopes in mils, dial sights were graduated from 0 to 359 degrees and could be set to the nearest 5 minutes. They recorded the zero line, usually by reference to a distant object, (or closer night picket) called a Gun Aiming Point (GAP). Aiming posts or a parallelescope were also used, the latter being best when guns were well dug-in. All these devices ensured parallelism between guns was maintained when the position of guns’ dial sights changed as the guns moved when firing or aiming at targets widely apart, this is explained on the 'Sights and Laying' page. SP guns were fitted with binnacle compasses to ensure the vehicle oriented itself correctly when coming into action. British guns used one man laying, by which one man layed in both line (using the dial sight) and elevation using calibrating sights or gun-rule and sight clinometer. This was faster than two men laying used in some other armies, notably the US (the USSR used one man). Calibrating sights or gun-rules made the total process even faster. They enabled a command post to order a single range in yards, not angular elevations, applicable to all its guns. It meant that the CP didn’t have to calculate elevation angles and order them to each gun (each gun had different MV), which saved time. The sight clinometer was for angle of sight. Guns, and mortars in RA use, were always re-layed between every round fired. Guns also had field clinometers when more accurate laying was required, such as the destruction of point targets, which was usually undertaken by a single gun and the elevation was then calculated in the CP. For more details and pictures see the 'Sights and Laying' and 'Laying & Orienting the Guns' pages. The detachment used a fuze indicator for air-burst fuzes. This enabled them to find their own fuze length time when given the range. However, it also accepted a 'corrector' setting that the CP calculated to compensate for non-standard conditions for these fuzes. Observers adjusted the height of burst by ordering correction to the corrector not to the fuze length. Nevertheless some guns, notably those lingering from WW1 and unmodified or of US origin, did not have gun-rules or fuze indicators. However, by early 1944 there was a program to replace all US panoramic telescopes with dial sights and to produce gun-rules and fuze indicators for all guns. The fuze length was set onto the fuze using a fuze key or fuze setter. Normally one gun in each troop had a thermometer used continuously to measure charge temperature with readings taken every few hours. Every gun had a Memoranda of Examination that accompanied the gun wherever it went. Most importantly it recorded the daily number of rounds fired in terms of their equivalent full charges (EFC), this and recorded wear measurements enabled the MV to be updated for wear without calibration firing. Method of laying out the line (ie using the director to orient the guns parallel to each other in the zero line). Obtaining and checking parallelism (of the guns, keeping the guns parallel was of fundamental importance). Preparation of concentration & distribution and position correction tables (for opportunity targets and normal concentrations guns were fired parallel, but they could also be concentrated or aimed evenly spread out along a line as linears). Link shooting and use of fan and window (the procedures between TCPs). Procedure for air-shoots (targets engaged by air observers, both AOPs and Arty/R). Air-burst ranging (used with cross observation to range on accurately located targets that were out of sight). Calculation of correction of the moment from meteor telegram or ranging (to compensate for non-standard conditions). Deduction of co-ordinates from shooting and adjusting angle of sight (ie registration). Barrages and programme shoots including predicted smoke screens (fire plan procedures). Recording and numbering of targets and correction of records on change of grid. Procedure for the quick barrage. On the battery position firing data was produced in either a TCP, the BCP or both. The artillery board was the usual means of producing map data, unless accuracy took precedence over speed in which case trigonometry and logarithms were used. The battery CP had a board set up for each troop, and for some types of engagement the procedures involved comparing the data produced in BCP and TCPs as a check against errors. In others one TCP (control troop) produced data for the other using a technique that had been 'borrowed' from the French, the 'rapporteur' or 'window' that enabled the results of ranging by one troop to be converted to data for the other. Generally the two types of CP had different responsibilities. The two troops could, of course, engage different targets simultaneously. However, for observed fire using a battery or less the observer always ordered firing data, the range and switch from the zero line, as ranging corrections. Often he sent this data to start the shoot. The control TCP did not change the data. Corrections for non-standard conditions were at the observer's discretion, however, corrections for muzzle velocity variations were always applied automatically by the guns' calibrating sights and the drift correction could also be set directly on the sights. More details including pictures are on the 'WW2 Fire Control' page. When available, there was a tannoy loudspeaker at each section connected to their TCP by line, each gun had a handset connected to it. Pressing the handset's pressel switch caused a light to switch-on on a display box in the CP to show that the gun had received its orders. Alternatively orders and reports could be shouted with or without the help of a loud hailer and acknowledged by visual signal. This meant that orders were given to the guns quickly and correctly, thus saving time. However, SP guns were fitted with radios. For a description of the gunnery problem see the 'The Basics of Gunnery' page and for extended detail about gunnery procedures and associated fire discipline see the 'Fire Discipline' page. See the 'Ballistics & Data' page in the fire control part of this site for more information including pictures about range tables and corrections. Artillery survey is concerned with providing fixation (ie exact location) and orientation (where grid North is) to the guns, and other equipment and places. The goal of this survey is to provide this data accurate to the map grid in use, 'theatre grid'. As an intermediate step surveyed points could be put on a common grid, so that batteries are correct in relation to one another but not to the map. 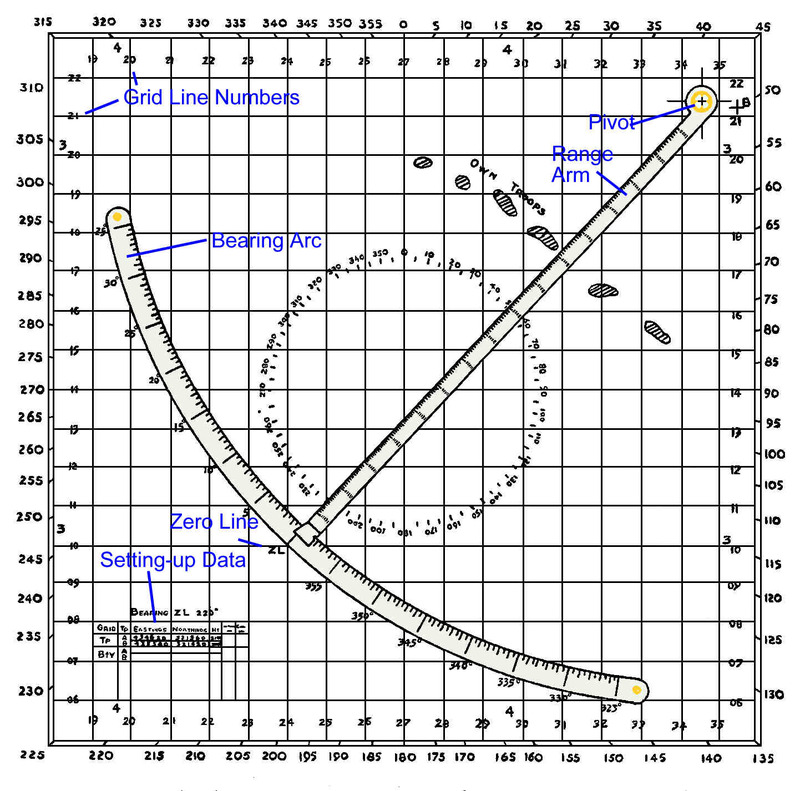 The mechanics of survey involve measuring bearings and distances (‘traverses’) using some form of triangulation from survey control points and related trigonometric calculations. These traverses 'carried' fix and orientation from a known point to an 'unknown' one. However, battery surveyors calculating from sun or star observations could provide accurate orientation earlier than accurate fixation could usually be carried (weather permitting). The topographic surveyors, who produced the data for map making, established their own triangulated survey control points, typically on high ground. These control points were seldom dense enough on the ground or in the right places for artillery use so artillery surveyors created their own additional ones called 'Bearing Pickets' (BP), they provided data for both fix and orientation. When the front was static surveyors would create a network of BPs in the likely gun areas so units moving in could quickly get onto theatre grid. Accurate survey was essential for predicted fire and a common grid facilitated multi-battery engagements. Procedures had been developed soon after WW1 as a fast process suitable for mobile operations instead of relying on Royal Engineers (RE) survey units to survey all battery positions. After WW1 RA created its own survey units and gun regiments had their own survey sections. By WW2 there was a Survey Regiment RA in each corps, although most of their work was target acquisition. Survey practices evolved throughout the war. However, it was always a ‘bottom-up’ process, unless deployment planning enabled survey to take place in advance. Each battery started by establishing its own fix, typically by map spot or resection from features marked on the map, and orientation using the magnetic compass in their directors. The regimental survey section then brought all batteries onto common fixation and orientation by establishing BPs in the battery areas (regimental grid). Subsequently surveyors from the corps artillery survey regiment brought all regiments onto an accurate grid and orientation (theatre grid) by updating one of the regimental surveyors' BPs. In some poorly mapped theatres division and corps grids were also used as intermediate stages. The corps surveyors used theodolites and had mechanical calculating machines; regimental ones used directors and calculated using logarithms. At each change of grid the batteries corrected their own fix and orientation, and modified their registered target data. In the desert from early 1942 air-burst fixation was used. A designated troop fire a series of high air-burst shells at two different points 30° apart, other batteries observed these with a director, enabling them to all put themselves onto a slightly rough common grid. For more information including pictures see the 'Maps & Survey' page in the fire control part of this site. Meteor telegrams provided data to graphically calculate corrections of the moment, essential for predicted fire. The provision of meteorological data was a RAF responsibility as part of their weather forecasting, although in Canadian and Australian formations artillery meteor units did it. However, conversion of the meteorological data into meteor telegrams for issue to artillery units was often done by corps survey regiments and these regiments had a small RAF met detachment in each sound ranging troop. Early in the war meteor telegrams were issued as at 0600, 1200 and 1800. By about 1942 they were issued every 4 hours, although for major operations 2 hourly messages were sometimes used. In 1942 RAF mobile meteor stations were provided to each corps, and in 1943 sections were established in each HQRA and HQ AGRA. These sections could fly balloons and receive upper air temperature broadcasts enabling them or survey regiments to prepare meteor telegrams. However, each was very small (an officer and 2 NCOs) and could not individually produce meteor telegrams continuously every few hours. In the battery this data was used to calculate two corrections for each charge (ie two different ranges) on the zero line and a switch either side. These range pair corrections were then plotted on a graph in the BCP. Meteor telegrams provided, for various times of flight (of shells), wind speed and direction and air temperature and pressure. These were calculated by tracking local met balloon ascents and receiving high altitude wind broadcasts. Towards the end of the war balloon tracking was sometimes done by radar. A 'rough and ready' method of estimating meteor corrections was introduced as a 'last resort' in case meteor telegrams weren't available. It was only applicable to NW Europe, basically wind speed was estimated by its signs and this with an estimate of cloud cover was used to find a correction from simple tables. An alternative to using meteor telegrams to produce correction of the moment data was to use data derived from accurately ranging an accurately known datum point although the data derived by this method was only valid for a very small area and from the same type of gun and the same charge used to derive it. A related but simpler technique was the witness point, which enabled firing data for one target to be adjusted by ranging another. For more information see the 'Meteor' page in the fire control part of this site. MV data is essential for predicted fire and to ensure that the guns’ fall-of-shot is not too spread out in range relative to one another. As guns’ barrels and chambers wear from firing their MV decreases and shells become less stable in flight. However, MV also varies with differences between different manufacturing 'lots' of propellant and between types of propellant in worn guns. Calibration is the process of determining a gun's MV by firing. Maintaining up-to-date MV data in war was a major challenge. Again practices evolved throughout the war because while the best solution is to take the guns to a calibration range this was seldom practical. For example, in the period before El Alamein medium guns, being used with predicted fire against depth targets were being calibrated every three days. British practice evolved to comparative calibration in which a theatre calibration troop was kept accurately calibrated and moved from unit to unit to shoot alongside their guns and compare the ranges achieved for different charges fired at the same elevation. The differences enabled calculation of revised MVs, these were maintained reasonably up to date by measuring guns’ wear and recording the EFCs fired and making corresponding adjustments to MV. However, this did not solve the problem of variations between batches of propellant, although sorting into batches and having all guns use the same batch for a target ensured consistent firing. Nevertheless in Italy in 1944-5 even this proved impossible because there were so many different batches from ammunition factories in many countries. This adversely affected the accuracy of predicted fire. For more information see the 'Calibration' page in the fire control part of this site. Targets were attacked with either programmed or impromptu shoots. Programmed shoots generally meant a fire plan coordinated with the supported troops, although some types of fire such as Harassing or Counter-Battery may have coordinated only with a formation HQ. Programmed shoots supporting a major operation could involve a large number of regiments. Programmed fire against a target was either scheduled or on-call, but scheduled followed by on-call if necessary was possible. Impromptu fire was used when a target unexpectedly presented itself, in size it could vary from a single troop of four guns to a concentration of many regiments, and impromptu targets could be previously registered (ranged and recorded) or have been planned as a possible future target. Causing casualties to the enemy and shaking their morale. Preventing the enemy using their weapons effectively. Neutralization of enemy weapons though casualties, demoralisation, preventing observation, disorganising command and control and damaging equipment. Destruction of structures and material. Cooperation with the supported arm. Economy of force, which followed from concentration. Artillery preparation – to cause casualties and damage before assault. Covering fire (CF) – to neutralize the enemy during the assault using barrages, concentrations or smoke. Counter-battery (CB) – to neutralize or destroy enemy artillery. Harassing fire (HF) – hampering movement to the front, hindering the conduct of operations and reducing morale. Counter preparation (CP) – to cause casualties and damage to enemy forces and to disorganise and break up imminent attacks. It was dropped from British doctrine in 1941 because it was considered, practically, to be no different to DF. Defensive fire (DF)- to cause casualties and damage to enemy attacks. Harassing fire (HF) – hampering movement to the front, hindering the conduct of operations, and reducing morale. Immediate neutralisation (IN) – the ‘standard’ type of shoot, section ranging. Although called neutralisation, the aim could be to cause casualties and damage. Fleeting opportunities – moving targets or targets likely to move, could be ranged with gunfire (without bracketing) or section ranging with the guns firing at different ranges, the purpose was often to cause damage and casualties. Close to own troops – special rules about maximum corrections. Pin-point – normally a single gun target with the aim of destroying a 'point' target. The CPO selected the least worn gun and ordered angular elevations, with the gun laying using its field clinometer not the gun rule. Registration – to record for future engagement. It could be recorded 'corrected' or 'uncorrected', the latter meant that it had to be used within the current meteor period because its registered location was not adjusted for correction of the moment. Quick smoke – an abbreviated smoke screen procedure where guns’ aim-points were not laid out in an optimum line. The observer calculated where to place it and how much to fire. Smoke was considered a form of neutralisation because it ‘neutralized’ observation by the enemy. The British considered the shell to be the weapon of artillery, not the gun. HE shells were filled with TNT or Amatol/TNT (60/40), but in early 1945 TNT/RDX was introduced for improved anti-personnel effects from better fragmentation, it reflected the recent research that showed that far smaller fragments than had previously been assumed were effective, see the 'Weight of Fire' page. The RA entered WW2 with HE and base ejection (BE) smoke for field batteries. An early decision was made not to introduce a time fuze for HE because of the training difficulties for a citizen army. Fortunately, at Canadian insistence, this decision was changed although appropriate fuzes did not appear in quantity until late 1942. Ricochet fire was also used as a means of obtaining air-bursts with graze fuzes. Against troops and guns in the open or under light cover, for offensive and protective covering fire, harassing fire and wire cutting. For concussion effect against works constructed of concrete or masonry. Against tanks for damaging the tracks. For destruction of buildings and strong cover, other than concrete. For destruction of trenches by the crater effect produced, and against tanks. And in the case of heavy howitzers, against very strong cover including concrete. To increase the screening effect of covering fire, to mask hostile fire, and to deny observation to the enemy, in certain circumstances as a signal of pre-arranged meaning. Often useful for ranging field guns, especially with air observation. British fuze actions were either 'percussion' or 'time'. The former were impact fuzes and could be either 'direct action' (DA) or 'graze'. Some graze fuzes also had a delay option. Graze fuzes had an extremely short delay, whereas DA fuzes were instantaneous, in delay fuzes the delay time was longer, up to 0.1 of a second. Time fuzes enabled shells to be burst in the air. 'Time and percussion' fuzes had 'graze' action for percussion. US fuzes were used with US ammunition for 105-mm How, 155-mm Gun, 8-in Gun and 240-mm How. The interoperability problem was that UK and US had different size fuze cavities and thread gauges in their shells so British fuzes could not be used in US shells and vice versa. In December 1944 SHAEF released VT (proximity) airburst fuzes for field artillery use. However, due to their unreliability, such as early bursts in heavy weather, the British did not generally use them against opportunity targets. Base Ejection (BE) smoke used a carrier shell with a time fuze to eject burning smoke cannisters about 300 feet above the ground. White Phosphorus (WP) smoke was not used, apart from with 105-mm and 3.7-inch How. WP was considered less effective than BE smoke for screening purposes and trials showed that its anti-personnel effects were very limited against troops in temperate climate uniforms. Gas shells were developed but, of course, never used. Propaganda shells (filled with leaflets) were adopted and used from early 1943 onwards, these carrier shells were often filled with their leaflets on the gun position. Parachute star shells were to illuminate the battlefield. Coloured smoke (red, blue, yellow and green) was introduced in 1943 and coloured flare shells performed the same function at night. Several sets of trials were undertaken to establish the effectiveness of HE fire for wire cutting and breaching mine fields. It was ineffective for the latter and although weight of fire data was produced it was not a satisfactory solution for the former and was not generally used. More details about British ammunition, including pictures are on the 'Ammunition' page. A characteristic of 20th Century warfare was the ‘empty battlefield’. Forward troops and OPs are not presented with a continuous array of targets to attack, the enemy remained concealed. However, WW2 was unlike WW1 in that generally the opposing forces were some distance from each other unless they were attacking. The enemy only appeared when attacking or because of a tactical misjudgment, perhaps when an OP had visibility some distance into enemy held territory. For the FOO, targets may ‘announce’ themselves, often unpleasantly. However, finding their size and layout can be a challenge. Behind the forward area matters become easier, although the enemy quickly learns what can be seen from where and behaves accordingly. As in WW1 air observation was a key means of observed fire against hostile batteries (HB) and other targets beyond the view of ground observers. AOPs, particularly in Burma, played the vital role once they became available, and were later able to take useful photographs as well. Air photo reconnaissance was also a major asset and other RAF aircraft could report and engage ground targets using the Arty/R procedure, although this was not as widely used as the army desired. Airborne formations had their Forward Observer Unit (FOU (Airborne)) that provided communications to other artillery in range and provided additional observers to supplement the single air landing artillery regiment in the division. There was at least one instance of 'special OPs' being used. In Italy in late 1944 1st Cdn AGRA created two volunteer OP parties who, with partisan help, landed behind German lines on the Adriatic coast and deployed in the German gun area. They spent two weeks attacking hostile batteries using the firepower of Canadian and British medium and heavy batteries. The corps survey regiment was the source of more technical target acquisition resources particularly for CB purposes and provided sound ranging and flash spotting capabilities. Locating HBs and mortars was not enough, as WW1 had shown a CB organisation was required and each corps had a Counter Battery Officer and staff. Late in 1944 divisional counter-mortar staffs were authorised as well as other specialised batteries. More details about target acquisition are on the 'Target Acquisition and Counter-Battery' page. Air-burst ranging, using cross-observation had been used in WW1, was re-recognised in 1941 and re-adopted as air-burst fuzes became available. It could be used for three purposes, to range targets of known co-ordinates but out of sight on the ground, as a datum point procedure to produce corrections for non-standard conditions, and for calibrating guns in their battle positions. The corps survey regiment had a troop for cross-observation. a correction from another target (registered or immediately previous) using cardinal point(s) and distance(s). The second tended to be the preferred method when ranging for a battery or smaller target because it was the quickest, the British view was that speed to get effective rounds on the ground was more important than ammunition economy and initial accuracy. More importantly being ranged might disrupt the enemy's activity and prompt fire gave moral support to friendly forces before the target was properly ranged and fully effective gunfire applied. The observer also decided if corrections for non-standard conditions were to be applied. If ranging they usually weren't unless accuracy was important for the safety of own troops or the meteor correction was large (at around maximum range in summer in the desert the guns might fire some 700 yards too far). The result was that the observer warned the battery (eg "Battery Target") of the impending target while measuring range, switch and angle of sight (zero was generally used if speed was important). He ordered this to the TCP and having alerted the guns the GPO selected a charge and ordered the observer's data to the guns, which set it onto their sights (calibrating sights meant that the CP did not convert the range to an angular elevation, and the sights corrected the range for muzzle velocity dfference from standard). Examples are given on the 'Fire Discipline' page. British practice was to aim the guns of each troop to give a roughly straight line at right angles to the line of fire. This meant that when the switch from the zero line was more that about 20°, or the troop had an irregular layout, then position corrections (increasing or decreasing each gun's range to the target) were used. In 1943, given the constraints of small gun positions in New Guinea, the Australian artillery adopted as standard practice corrections to give a troop a 100 yard frontage. However, there were standard procedures for troops to fire with their guns other than parallel. Guns could be 'concentrated' to reduce frontage and 'distributed' to increase it. In addition 'sweep' and 'search' were available to cover a larger area than the 'natural' fall of shot. Ranging was normally by a section, the 2 guns using either the same or different range. The observer ordered "Battery (or Troop) Target" this alerted the gun position, detachments were ordered to 'take post' and be ready to fire. In parallel the observer produced his firing data or target location. Observers were supposed to be able to produce their data in about a minute from identifying the target and it generally took about 30 – 60 seconds from receiving the observer's data in the battery to firing the first ranging shells. In total about 90 - 120 seconds from the time an observer decided to engage a target to the shells being on their way. This was considerably faster than most armies that did not use British type procedures. Ranging corrections were ordered relative to a line through battery and target (BT). If the observer was close to this line then he ordered a correction to bring the shells onto BT and bracketed the target for range. This procedure demanded that he establish a long bracket (successive shells over and short of the target) usually of 400 or 800 yards. The bracket length was halved until achieving a short bracket (usually 100 yards) or target round or contradiction - section’s shells either side of target, then he split the short bracket and ordered the appropriate fire for effect, usually gunfire. If the observer was at closer to a right angle to the BT line then he could first bracket for line on the OT line. Corrections were always sent as orders to the guns to move their aim-point, they were never observations of where the shells fell relative to the target. See the 'Basics of Gunnery' page for more details. Observers ordered corrections as angular switches and ranges for battery and troop targets. When an impromptu target was ordered using a map reference the CPO reported the opening BT range to the observer. Ranging on the BT line required the observer to visualise the BT line on the ground and there were various techniques for this. However, section ranging made it easier and cross observation by two observers could be used, but not usually by battery observers. In 1942 ranging on the observer-target (OT) line was formally introduced. It was for use in featureless terrain where it was extremely difficult to visualise BT line, although corrections were still ordered relative to BT. The general advantage of using BT was that the CP did not have to convert corrections from OT to BT so that they could be ordered to the guns, cutting out this step saved time. When ranging was complete and Gunfire ordered then the link procedure (using rapporteur or window methods) was carried out between the two Troop CPs in the battery. The controlling CP passed their range and switch to the other CP, which adjusted it and ordered it to their guns. This conversion was to the nearest 30 minutes and 50 yards. Both troops used position corrections to ensure that their guns were aimed in a roughly straight line at right angles to the line of fire, the rounding gave the combined fire of the two troops greater spread. There were procedures to reduce or increase the spread of a troop's fire. Normally the observer adjusted the Gunfire to ensure it was covering the target. An observer could use the two troops of his battery simultaneously against two different targets and the battery's two observers could each engage a different troop target simultaneously. If a battery's observers were presented with more targets than the battery could engage then the 'multi-battery' procedures enabled them to call for the fire from other batteries via their own BCP and RHQ. Predicted fire could be employed against any suitable target and 8 figure (ie 10 yard or metre precision) map references or coordinates were usually used. Predicted firing data was calculated by both BCP and TCPs and checked against each other. Normally map data was taken from the artillery board for predicted fire. Trigonometric calculations using 4 figure logarithms were used with registered targets to find the actual map co-ordinates of the target after taking out corrections for non-standard conditions. This was called deduction of co-ordinates (later reduction). They were also used with datum shoots to calculate bearing and distance and hence the correction for non-standard conditions by firing. Another alternative for ranging was ladder ranging whereby each gun in a troop fired one round at a different range and a short interval, enabling the observer to make a single correction and order gunfire, although the observer needed good observation of the target area for this. This procedure had been long used by the Royal Navy and coast defence artillery but it never caught-on for field use. For large targets the fire of troops, batteries or regiments could be moved individually so that the full target area was covered, although in multi-battery concentration this was quite large in any case. The alternative was sweep and/or search by which the guns varied their aim-point in line and/or range every round or few rounds. The observer (or fire planner) ordered the size and pattern of these variations. However, a key feature of the British system was that for impromptu targets the observer decided the type of ammunition to be used and the number of shells to be fired, with the exception of multi-battery targets if the observer was not 'authorised'. In this case he was given an ammunition allotment. The manner in which fire was applied was also left to the observer and his experience, this encouraged experiments and useful techniques were disseminated. For example in Normandy it was found that in the right conditions smoke could force German infantry out of their fighting positions in the bocage. Registered targets were ranged or predicted and the data recorded on a target record card. Procedures, including target numbering, evolved significantly during the course of the war. The problem was to ensure that the same number was not used for different targets within the same control domain, numbers being allotted by observers, commanders, staffs or CPs. Generally each had blocks of numbers unique to them in a domain. Numbers were prefixed by a letter that showed the domain. 'P' to 'T' was used for each batteries' targets within a regiment, 'M' for regiment and 'U' for division. A target 'M2' would be recorded in all batteries within a regiment, and different regiments would have the same number for different targets. If it became a divisional target it would become 'U' with a new number allotted by HQRA, it would then be circulated to all batteries in the division. Targets engaged by two or more batteries were called 'concentrations' in British terminology. Until 1942 the procedures for concentrations against impromptu targets were not particularly slick, although there was a choice of several methods developed from the mid-1920's onwards, and concentrations of several RFA brigades had been achieved in 1914. Nevertheless, in May 1940 a British regiment destroyed a refueling panzer battalion in what is generally recognised as the first successful use in war of a wireless controlled concentration on an impromptu target. However, in 1941 Brig HJ Parham, the CRA of 38 Division, invented and tested new procedures. These culminated in demonstrating a 144 gun concentration against an impromptu target within 5 minutes of the target being called. In mid-1942 XIII Corps conducted further trials and new doctrine was issued is September that year. These concentrations were known as Mike (regiment), Uncle (division), Victor (corps), William (army) and Yoke (AGRA) targets and always initiated by the radio call “Mike Target, Mike Target, Mike Target” (or Uncle, etc) that galvanised CPs and guns to action. Any observer could request concentrations, however, some observers including Air OPs, were authorised to order them. It was usually Standing Instructions that a BC had this authority for his regiment, troop commanders were given it as required. BCs and COs of medium batteries and regiments were often CRA’s or CCRA’s Representatives and authorised to order the divisional or corps artillery and have communications on the divisional or corps artillery radio net. This authority was sometimes given to field BCs and observers, and there were sometimes CAGRA Representatives (BCs and COs) with similar authority. Authorised OPO/FOO were on their regimental wireless net and sent their target to the adjutant at RHQ and batteries in the regiment, unauthorised observers sent the target to their BCP for passage to the adjutant and other batteries. If the target was Uncle or higher the adjutant forwarded it to HQRA and the other regiments in the division who forwarded it to their batteries. If there was an assigned AGRA then HQRA sent it to them for their regiments and their batteries. The process was repeated, but more widely, for Victor targets. The first battery reporting ‘ready’ usually did the ranging, starting immediately. If the observer was’t authorised it was usually their own battery because they got the target details first. In essence multi-battery targets relied on good procedures for fire control and communications. The system was speeded up further in armoured divisions in NW Europe by deploying HQRA to the leading brigade HQ during an advance. Targets were located using a map reference or target number. The basic process for ranging was to use a single gun (although a secion of two guns was normally used), ordering corrections to it that all batteries in the engagement applied, unless otherwise ordered. If the correction was less than about 500 yards, it was ordered in the form Left or Right and Add or Drop in yards, which was applied by each battery to its own BT line. If more than about 500 yards then a cardinal point bearing and distance was used. Since these large concentrations covered quite large areas (regiment – about 250 × 250 yards, division about 350 × 350 yards, division with AGRA about 400 × 400 yards) precise corrections were generally deemed unnecessary. In each battery all CPs calculated map data, which had to agree to within 50 yards and 30 minutes between the BCP and TCPs. On completion of ranging a regimental target it was usual to fire a single round from the pivot gun in each battery, and from each regiment for multi-regiment targets, before ordering gunfire. Obviously the more regiments firing at a target the bigger the area affected by the fire. However, this was not a linear relationship. Basically, each troop’s mean point of impact (MPI) would be a distance from the MPI of the whole concentration in some direction. The more troops there were the greater the probability of there being some at a greater distance, a normal probability distribution. This is explained in more detail on the Errors and Mistakes page. In mid 1942 the NZ division was in Syria and developed there own standard methods of applying fire. One, initially called Method A, and later called 'Murder' was a predicted divisional artillery concentration on a point. The other was given the name Stonk, and was a predicted divisional concentration across an area covering 1200 × 600 yards and used against an advancing force. These were adopted by other divisions in the Middle East and into Italy. However, the NZ methods pre-dated the new methods for concentrations introduced later in 1942. These in effect superceded 'Murder' although it seems to have lingered on as a nickname for a predicted concentration (normally predicted data was not used, the observer had to specifically order it). The effectiveness of the large area stonk by 72 guns can also be doubted, no doubt it raised a lot of dust and looked impressive but the density of fire was low. However, the name 'stonk' caught on and meant different things in different places. In 1944 they were formalised by RA policy as a substantially smaller linear (not an area) just 525 yards long. This length for was suitable for all types of regiment (field, medium and heavy) and its calculation was speeded by use of templates in the CPs. When more that one regiment engaged it each regiment covered the full length but the distance between gun aimpoints reflected the number of guns in each type of regiment. However, 2 NZ Division continued to use its area stonks. Some divisions introduced Standing Instructions for pattern fire, several parallel stonks, with the field regiments firing those nearest to own troops, or other standard distributions not based on stonks. The range and arc of fire of different batteries could be a limitation on the number of batteries in a multi-battery engagement, although the use of 'scale', part of the new procedure, compensated for batteries that could not engage. In the Normandy bridgehead some field batteries found themselves with arcs of up to 340° and air landed batteries were always prepared to fire throughout a 360° arc. As long as close local crests, such as trees, had been cleared such wide arcs were easily covered by 25-pdrs (providing their gun pits had been suitably built) because of their platforms. Guns with split trails such as 5.5-inch could engage wide arcs with some physical effort, as was the case with 7.2-inch up to Mk 4. Guns on M1 carriages (155-mm and 7.2-inch Mks 5 & 6) were unable to engage outside their 30° left and right traverse (because of the need for four spadeholes to be dug for each gun). SPs were also limited for opportunity targets having even less traverse, 15° left and 30° right (M7 Priest) and 24° left and 16° right (Sexton), this traverse limitation may be part of the reason for the relatively limited numbers of SP regiments. However, in Burma it became the practice to use small gun pits for 25-pdr and 3.7-inch How, which meant that guns took a little time to reposition and needed new line from the director if they had to shoot rearwards. Timings are not entirely clear. In the early days a Victor target by 1st Canadian Corps in Italy using 668 guns (30 Canadian, British and Polish regiments) was timed at 33 minutes to time on target (which was a slow method). By the end of the war Victor targets with 1000 guns were not unusual, the British was the only army routinely using such large concentrations against opportunity targets. From early 1944 Mike, Uncle and Victor targets were used increasingly in Burma. An army (William) target was the largest but because there was no HQRA at Army level it was controlled by one corps HQRA requesting additional fire from another that was 'In Support'. The normal order for 'fire for effect' against opportunity targets was "nn rounds gunfire". However, for multi-regiment targets a ‘scale’ was usually ordered. Scale 3 meant that every gun had to fire 3 rounds, if a battery in a regiment was engaged against another target then that regiment made up for the missing battery by having its other batteries fire extra rounds. Similarly in a battery, division or corps artillery. A third method was 'rate', however, this was usually only used in fire plans when a duration was required and different types of gun were involved, see below. The problem was that different guns had different rates of fire, so while a 25-pdr would fire '5 rounds Gunfire' in under a minute it would take heavy guns such as 7.2-inch How or 155-mm Gun about 5 minutes. The amount of fire used on a target was a matter for the originator or observer. There were Standing Instruction rates and quantities for DFs, and agreements with the RAF for Arty/R. However, the basic approach was to rely on the observers’ experience and their observation of the effects of fire on the target. It was generally considered that short bursts of fire were the most effective, as in the counter-battery bombard procedure. However, bursts don’t provide CF, which needs continuous neutralisation. Obviously the thinking behind the 'short burst' doctrine was to repeatedly catch the enemy by surprise with the goal of causing casualties. Large multi-regiment impromptu targets were often ordered ‘engage at’, in which very precise time synchronisation was less important. For opportunity targets involving about one regiment the observer normally ordered them to fire when sufficient batteries had reported 'ready'. Alternatively the observer could control the moment of firing by use of the commands 'fire by order' then 'fire' at the appropriate moment. However, Time on Target TOT) had been introduced in North Africa in early 1942 for concentrations with the batteries' clocks being synchronised from routine time signals broadcast by the BBC. When own troops' safety was a consideration the observer could also order 'no rounds after . . . .' (a particular time). The problem with ToT was that the observers tended to err on the side of caution and be generous with the amount of time they allowed for all batteries to be ready to fire. This meant that ToT engagements took longer than others, and hence was contrary to the usual British desire to have rounds on the ground as fast as possible. There were two aspects to the time to engage a formation target. That taken to range and that taken to allot the batteries and pass orders, reports and any corrections through the hierarchical communications system, and this would depend on the number of links there were in the chain and the number of stations on each link. A Mike target by an authorised observer probably took just ranging time, starting almost as quickly as a battery target, and in NW Europe where the maps were quite good and meteor corrections not huge there were probably seldom more than four ranging rounds, perhaps 90 seconds between each. Unauthorised observers had first to get an allotment of batteries or regiments, which increased the time. While the direct support units were responsive to the supported arm, there were also Air OPs and observers from medium and heavy batteries under corps or AGRA control. In Italy co-ordination procedures had to be introduced through use of a ‘shell line’. Basically the divisional artillery initiated targets within the shell line in their boundaries but the others could only initiate beyond it unless co-ordinated with the division. If an advance was underway then the shell line was usually set at the day’s objective. FOOs would select targets for Defensive Fire (DF) in consultation with the supported company commander and submit them to their BC for co-ordination. From these, in discussion with the battalion CO, the BC would designate a DF(SOS) target for the battery, which the guns aimed at when not otherwise engaged. The battery's target list would be further co-ordinated into a regimental one, and the process repeated at formation level. Some DFs might be ranged and registered, and in Burma most were and often as close as 25 yards from the forward infantry positions. Defensive fire plans were by their very nature 'on-call'. However, several targets were often grouped together and called as one. By 1943 it was generally recognised, at least in the European theatres, that DFs had to be fired by at least a regiment. Generally a DF was a standing barrage of one or two lines. Stonks were widely used as DFs. Standing barrages were also use for blocking purposes in attack fire plans, sometimes as three sided box barrages. The amount of fire used on a DF or DF(SOS) was usually set by Standing Orders, at least for the initial 'burst'. Counter Preparation and Harassing Fire (HF) targets were usually planned at regimental or higher levels. The first typically involved heavy concentrations, either predicted or observed using air-burst ranging or an Air OP. HF usually involved a section, troop or battery and was almost always predicted, although sometime important targets that were regularly harassed might be registered after being ranged. The key to successful HF was to avoid predictability in the times or places of targets and the Germans learnt that the British tended to stop firing at meal times. Fire planning ('programme shoots') used barrages or concentrations, and these together with smoke screens could all exist in one fire plan. Targets in a fire plan were ranged or predicted. They could also be on a timed programme or on-call. The fire plan could be a simple as a FOO ordering a concentration to neutralize a target in 15 minutes time through to a corps fire plan involving 25 regiments firing a barrage 4 miles wide lasting several hours and planned days ahead. Larger fire plans were also used and in the last months of the war included a substantial ‘pepperpot’ component. This was the term for extensive use of non- field artillery fire. It included LAA, tanks, mortars and medium MGs. Some officers regarded barrages as old fashioned, and unsuitable, however, experience showed this was not the case and they were used quite extensively. More detail about fire planning is on the 'Fire Plans' page. Fire planning and its use and processes evolved continuously throughout the war, with the general goal of speeding up their preparation and increasing their flexibility. Quick fire planning techniques for use in support of company and battalion attacks also emerged. Although there was a stage when entirely on-call attack fire plans were popular, this was short lived and the accepted tactic in European theatres became a mix of time scheduled and on-call targets. On-call fire plans were preferred in Burma because of the difficulties in estimating movement time through jungle. Silent fire plans were also used, particularly for night attacks, they generally used on-call concentrations fired when the enemy discovered the attack. Fire plan orders were issued as map traces annotated with times and rates of fire, task tables that gave target map references with engagement details, or for very simple fire plans verbal orders sent over line or radio. The CRA was usually the fire planner for division and brigade attacks, although in the latter case he would normally leave control of the fire plan to CO of the regiment in support of the brigade. However, the policy of the regimental commander being with the brigade commander meant that sometimes the fire planner was the artillery commander with the tactical commander of the operation, although for divisional and corps fire plans the detailed work was done by the artillery commander's staff and the CB component was usually planned by the CBO or ACBO. In all timed fire plans engagement times were ordered to the whole minute. The barrage tended to be the main feature of British major attack fire plans, with concentrations fired in and outside it. Most of the effort went into Covering Fire (CF), ie neutralisation. There was usually a preparation element to cause casualties and damage, but not as heavy or extensive as other armies, and HF tasks might be included if resources allowed, but were unusual. DFs were planned to help protect captured objectives from counter-attacks, this was most important when fighting Germans whose great strength was rapid counter-attack. CB targets were engaged, including the use of bombards. Counter-AA targets, called ‘Apple Pie’ in European theatres, were included in major fire plans when air support was incorporated. As the war progressed, fire plans of concentrations became common, initially the guns fired with lines of fire parallel as at multi-battery opportunity targets. One technique was to group the concentrations and linears in an area under a code name, with fire control orders being applied to all targets in the named group. In the last months of the war in NW Europe major fire plans made great use of stonks and standing barrages as concentrations. In large 'deliberate' fire plans some targets would be selected by the attacking battalions and their BCs. These were sent to the artillery commander' staff for co-ordination and incorporation in the plan. Generally, British practice was to fire concentrations sequentially not simultaneously as was the Soviet practice with their vast artillery arm. Smoke screens were used in fire plans, they could be predicted, although a ‘tester’ to confirm the local wind was often used. Screens could be multi or single battery and positioned about 250 yards from the enemy to be blinded. Gun aim-points were placed on a linear, with the distance between them depending on the wind direction. If the wind was along the line of the required screen then points were 300 yards apart, if across the line they were 75 yards apart. Whenever smoke was used there were alternative HE targets in case the screen was ineffective. One technique was to create a lane a few hundred yards wide between two screens that screened tanks from defiladed anti-tank guns, if the wind was favourable these screens could be rolling. Smoke screens could be sustained for long periods, on at least one occasion all day. More information about smokescreens is here. A barrage was a belt of fire that could be stationary (standing), for example as a DF or moving in front of the assaulting troops. They were structured on unit lanes with lines across them. In a barrage the guns fired at lines (ie linears), a troop's guns’ aim-points spread equally along each line’s troop lane width. This involved the CPs in each battery calculating the range and deflection for each gun to its aim-point on each line in the barrage that it had to fire at. Moving barrages had as many lines as needed to achieve the depth required. Moving barrages could be either creeping, rolling or block. When creeping, each line was engaged in turn, when fire lifted from the front most line it moved backwards to the next line (a-a, then b-b, etc in Figure 4). In rolling, several lines were engaged at once (eg a-a & b-b, when fire lifted from a-a it went to c-c). A block barrage had several lines engaged simultaneously and all lifting together to a new block (eg a-a, b-b & c-c lifting together to d-d, e-e & f-f). There were procedures for putting turns between lanes to give a crooked barrage. A 25-pdr troop could effectively cover a lane with 140 yards maximum width, lines were usually 100 yards apart. For a creeping barrage normal practice was for a field regiment to engage a regimental lane two batteries wide (560 yards maximum), with the third battery superimposed across the full width of the depth lane (ie open on b-b in Figure 4). For a dismounted infantry assault a regimental lane was normally 400 yards wide, the full width being used with armour. The opening line (a-a in Figure 4) was always positioned in front of the enemy’s most forward positions. Medium artillery had to engage lines at least 300 yards (d-d in Figure 4) back from the opening line. Field gun safety distances for dismounted infantry were 150 yards if the line of fire was overhead and 200 yards if fire was from a flank. The opening line was engaged for long enough for the assaulting troops to move from their start line to within 150 or 200 yards, then fire lifted to the next line. Creeping was normally used for dismounted attacks, rolling for tank and mounted ones. Barrages could be entirely predicted to achieve surprise but ranging was essential if firing units were not on a common survey grid. At least one point in a barrage was ranged and registered. For a simple straight line barrage it was usually a junction of line a-a and a lane boundary, but it could be a clearly defined point within a lane. 1942 planning times for units to prepare barrages, from the commander issuing orders, were three hours for regimental, 10 to 12 hours for a division and 24 for a corps. These times include deployment and survey but excluded any ammunition dumping. For a quick (as opposed to ‘ordinary’) divisional barrage, where the guns were already deployed, it was two hours. For a regiment 60 to 80 minutes assuming no more than 10 lines. Timings for fire plans of concentrations were not greatly different, although it would depend on the number of concentrations, analogous to the number of lines in the barrage. A characteristic of all British fire plans was 'superimposed units' to provide a reserve. These were used to engage on-call targets, particularly DFs, or even entirely unplanned ones. The doctrine was that they could be removed from a scheduled task without significantly affecting the success of fire on that task. For smaller fire plans they were usually the direct support battery or regiment of the battalion or brigade making the attack because the observers had the most direct communications with them. The availability of superimposed units meant that the units committed to the timed program were sacrosanct. Targets in fire plans were normally fired ‘time on target’ (ToT) from late 1942, care and time being taken to ensure synchronised time. In April 1945 2nd NZ Division made a series of divisional attacks in N Italy while acting as 'point' for 8th Army. The fire planning for each of these was probably the epitome of the 'art' involving up to 15 regiments under the CRA's command with the complete artillery plan being made and executed in around 24 hours. Although they were all different, typically the barrage component was about 4000 yards wide and 3000 yards deep. Up to 8 regiments fired dragnet creeping barrages of over 30 lines, each with different lift sequences. In between the barrages the field regiments switched to HF tasks. Other regiments and heavy mortars fired concentrations within and around the barrage lanes and a reinforced AGRA fired CB and CM tasks. Naturally there was a comprehensive DF plan to protect against counter-attacks. In 1941 Quick Barrages were introduced at regimental level using standard layouts and CP templates. They were followed in 1942 by quick regimental fire plans, enabled by the growing and successful use of radio communications and multi-battery concentrations. Typically, such fire plans were used to support quick battalion attacks. Quick fire planning became one of the most notable features of the British artillery system. Quick fire plans were a consequence and benefit of having the batteries' senior officers forward. Their characteristic was that all the orders were sent by radio, which was quick; no traces, schedule or 'hardcopy' target lists were distributed. This meant that they had to be simple and relatively small scale, and so required reduced preparation time. It was usual for key targets to be ranged and the tactical circumstances usually meant that total surprise was’t an issue. The BC usually deputed ranging and registering to one or both of his observers. As the war progressed the techniques and procedures for regimental or ‘BC’s’ fire plans evolved, and continued the obsession with speed. The time needed to develop them depended on the number of targets. They were particularly useful when operations turned to pursuit or during advances against light opposition. They were usually concentrations using a mix of timed and on-call targets. Increasingly battalion mortars were included in quick fire plans, although the extremely limited range of the 3-inch Mortar limited its use. Quick barrages used simplified procedures. Written orders and traces were not used, details being given verbally by radio, lanes did not turn or alter in width, each troop’s angle of sight remained the same throughout the barrage and templates and tabulated data were used in CPs. Since the quick barrage was less accurate, the start line was normally 500 yards from the opening line, so fire on that line had to last longer while the assaulting troops closed to the right safe distance. Modification techniques were introduced so that timings could be altered if the infantry’s progress was delayed or accelerated. Three basic states for modifications were established; either no modifications allowed, modifications by an artillery observer from observations or modifications by the supported arm through a BC or FOO. The difficult part of fire planning was planning the timings for the rate of advance and for the assaulting troops to maintain the planned rate of advance and so keep close to the barrage. This was exacerbated by the inability to modify a large barrage once fire was opened, apart from fire pausing on particular lines 'just in case'. The problem was the sustainable rate of advance to keep up with the irrevocable movement of the barrage. In 1918 the normal rate was 100 yards in four minutes and between the wars it was fixed at three minutes on the basis that infantry loads had lightened. In mountainous terrain, such as Italy, 100 yards in 15 minutes proved unachievable. In Holland in 1944 a rate of 100 yards in five minutes held up the infantry. However, a safe distance of 200 yards and a bogey time of two minutes meant a rate of 100 yards in 60 seconds! There were four alternatives: a barrage of such density and duration that the defenders were demoralised to the extent that they lost interest in fighting for an extended period after it lifted; a shell with a smaller safe distance; greater risk by getting closer to the barrage; or faster movement. In NW Europe it was found that tanks, either alone or carrying infantry, and carrier-borne infantry could advance at 150 or 200 yards per minute by day and 100 by night. The first, sustained demoralisation was also achieved on occasions and pressing closer to the barrage was also used. Take greater risks by the assaulting troops getting closer to the fire, this was possible if the guns were firing overhead and not too worn. It was engaged as successive and/or parallel stonks. In 1943 it became policy that a concentration should not be more than 200 yards deep when used for CF and this tended to lead to parallel stonks in larger fire plans. They could be engaged simultaneously or sequentially. When concentrations on the objective ceased it became usual to ‘lift-out’ onto targets surrounding the objective, to prevent interference from mutually supporting positions and forestall counter-attacks. The amount of fire used on a target was a matter for the fire planner. It was generally considered that short bursts of fire were the most effective, as in the bombard procedure, and this was also appropriate for most tasks. Obviously the thinking behind the 'short burst' doctrine was to repeatedly catch the enemy by surprise with the goal of causing casualties. However, bursts don’t provide CF, which needs continuous neutralisation. Neutralisation didn't need high rates of fire, which was fortunate because a barrage could last for several hours. ‘Gunfire’ meant that rounds were aimed and fired as quickly as possible, unless an interval had been ordered. For 25-pdr this was about 6 - 8 rounds per minute. This could only be sustained for a few minutes, intense rate was the maximum sustained rate that the guns could achieve without overheating. More details about offensive fire planning, including troop safety considerations, are given on the 'Fire Planning' page. The major question was whether to use observed (ie ranged) or predicted fire. The latter gave surprise and should, therefore, be more effective for causing casualties and not compromising an impending operation in the case of a fire plan. It also took longer to prepare to fire. However, predicted fire that took the enemy by surprise but missed the target was totally ineffective. In fact there is evidence that missing was worse than not firing because being missed enhanced the target’s morale. Of course if it could be observed it could be corrected, but the result was no better than ranged fire, more ammunition was used and it may or may not have been quicker overall. Operations research at the end of the war suggested that the accuracy of predicted fire had been poor, as few as 7% of predicted engagements were effective in Europe in 1944-5. This indicates that predicted fire was not the best solution. Of course one answer was to predict large multi-regiment concentrations and allow the natural spread of MPIs to ensure adequate coverage of the target. For further detail see the Mistakes & Errors page. Another approach was to range and register a target and engage it again later with predicted fire to achieve surprise. However, this depended on the target staying in its registered place. forced the infantry to advance in a straight line and keep step with the barrage, across its entire width and its depth. Their great advantage was that they removed the need to properly identify every enemy position, this made the planning process quicker than identifying and planning every possible target, which was the case for a fire plan of concentrations. By covering all the ground with fire the infantry didn't get nasty surprises from previously unidentified positions. For the frontages and relatively high troop densities of WW2, and the objective of neutralisation, barrages were a practical solution. Whether barrages were quicker or slower to produce in CPs depended on the number of targets or barrage lines. However, a field regiment's barrage frontage of 280 yards meant that several divisions worth of regiments were usually required to support a divisional attack on a frontage of a few thousand yards, and the depth of German defensive positions meant a lot of lines (usually 100 yards apart) in a barrage. Techniques for irregular shaped barrages were developed. Nevertheless, as the war progressed the trend was to concentrations. By the final year or so of the war radio communications and modification procedures made it possible to modify smaller barrages by 'dwelling' if the infantry got behind or speeding up if progress was faster. However, the lag inherent in hierarchical net-based radio systems meant that this was not practical for large barrages. Although it was seldom a problem for the British in WW2, prolonged firing in a barrage could make guns very vulnerable to the enemy’s CB organisation and retaliation. The basic problem with timed targets was synchronisation with the assaulting troops, although this was less of a problem if timings could be quickly and easily modified. On-call targets provide great flexibility, but even an on-call target needed a duration if the goal was neutralization. There is little point in having on-call targets for CB and preparation fire before the assault starts, apart from those to attack HBs that become active. Since air forces also liked precise timing counter-AA targets were almost always timed. Offensive operations, and phases within them had times, the first being Zero Hour when the assault troops crossed the start line. Clearly some targets would be attacked at this point and so be timed. However, no plan survives Zero Hour unchanged so flexibility is essential thereafter. The fundamental problem for artillery control is the inherent conflict between centralisation and decentralisation. Concentration of firepower was an artillery principle recognised by the British, yet they also escaped the pressure, that afflicted other artilleries, to provide dedicated guns to infantry regiments and the extensive use of assault guns. The main reason for this was the flexibility of their control arrangements. The first key was the presence of a battery's more senior officers with the authority to order fire, this provided the infantry with an acceptable guarantee of fire support. At the same time it solved the common artillery fear that if the infantry could order fire whenever they wanted then it would be 'wasted' on insignificant targets. At the same time fire control could be centralised and fire concentrated when it was necessary. BCs with their supported battalion commander made quick fire plans, they also co-ordinated their observers in the use of their battery. CRAs and their staffs made formation fire plans and their HQRAs allotted units for Uncle and Victor targets requested by un-authorised observers. At brigade/regiment level the CO at Brigade HQ was the fire planner but the adjutant away at RHQ allotted batteries for Mike targets. This does not seem to have caused problems. Most British guns were just that, guns not howitzers. A particular problem for applying fire emerged in Italy and Burma due to the mountainous terrain and consequent need for upper register fire that could get at targets tucked in valleys and behind steep hills. This was achieved for the 25-pdr by introducing intermediate charges, a modified sight mount, 'bar' gun rules, and raising the wheels above the spade level (eg by digging a trench for the spade), a cranked trail was introduced on the 25-pdr Mk 3 carriage, but did not enter service until after the war. See the 'Guns' and the 'WW2 Fire Control' pages. The British undertook considerable research, using studies, trials, experiments and analysis of the results of enemy attacks on British forces and British attacks on the enemy, into the effectiveness of artillery fire and how much was needed against particular targets. Although tabulated data was produced it was never used in the field (apart from the fire plan for D-Day). For details about weight of fire see the 'Effects and Weight of Fire' page. One of the early results was to prove that the old wounding criteria, based on pre-WW1 French research, of 58 foot-pounds was excessive. This led to new criteria being adopted. It's unclear if any new artillery ammunition using the new criteria was developed during WW2, the most likely would have been the 5.5-inch 80 lb shell and 4.2-inch mortar bomb. To prevent enemy movement and observation, and in cases of greater effect to prevent the effective use of enemy weapons. Effect to last during the bombardment. To produce, in addition to neutralisation, a lack of will to resist continuing for some time after the end of the bombardment. To kill or wound enemy personnel. To destroy or damage enemy equipment. Next the estimated weights of fire to achieve these effects. These are in terms of 25-pdr equivalence and shown in the next table. Note - the 15 minutes for demoralisation is suspect, it was based on one attack, at Wesel in 1945, before this it was considered that at least 4 hours of fire was needed. There does not appear to be any study of British artillery casualties in WW2. Apart from a detailed study of statistical sources this means relying on the anecdotal accounts in unit histories. Since most men were in the gun areas then its worth considering them first. The total RA losses, according to the 'Roll of Honour', were about 31,200 for all parts of the Regiment, this is about 22% of British Army's killed and still missing in action in 1946. At the end of 1944 British Army strength figures showed about 1000 officers and 14,000 other ranks from field artillery (including anti-tank) as prisoners in enemy hands. At the end of 1940 the total for all artillery had been 157 and 4,267. About 50% of the 1944 figure reflects the losses at Hong Kong and Singapore (and a substantially higher percentage for AA and Coast). Casualties in gun areas occur from ground attack, air attack or CB fire. The first seems to have been a feature of the early years of the North African Campaign and Burma, but overall figures are not recorded. Air attack was always a threat but does not seem to have been a significant one after 1943 and disappeared entirely in the final months of the war as photographs of guns wheel to wheel in open fields show. Effective CB by WW1 criteria also seems to have been rare, although it was sometimes heavy in N Africa, Italy, Normandy and the entry to Germany. The Wehrmarcht's artillery was but a shadow of its WW1 predecessor because the Luftwaffe had promised to provide all necessary firepower. By the time this was exposed as wishful thinking Germany no longer had the resources to re-create a powerful field artillery arm (resources went to AA artillery to counter the allied bomber offensive) and so concentrated on mortars, which posed a minimal CB threat. Although in Normandy some 70% of British infantry casualties came from mortar fire and counter-mortar became increasingly important. Japanese artillery seems to have been unable to deliver fire above battalion level and there do not seem to be any accounts of effective CB fire, at least against British or Australian forces. The most exposed elements of field artillery were the observers. Unit accounts suggest that they may have suffered high casualties in NW Europe 1944-5. For example one battery account records having 10 observers in the period. If all the losses were due to casualties then this is a loss rate of about 40% per month. It's not known if this was representative but it does tally with accounts from some other units. Losses in other theatres do not seem to have been this high. Although manpower shortages were a feature towards the end of the war, the war establishments of British units included their 'First Reinforcements'. This, together with cross-training meant that at least some casualties could be replaced very quickly. 1. Speed was an obsession when responding to calls for fire; the system delivered mobile firepower very quickly. 'Rounds of the ground' was what mattered, the sooner they were there the sooner beneficial effects started. 'Short-cut' options in procedures for impromptu targets facilitated speed. 2. Neutralisation was the predominant objective of artillery fire in offensive operations, and the 25-pdr had been designed for this role. They gave fire orders to the guns, which elicited a speedy response. They could guarantee the fire of their own units. They were fully in touch with the local tactical situation and ensured proper integration of the artillery plan and the supported arm plan, which they influenced to be supportable. They had the authority to be tactically flexible. They had the experience and rank to form effective working relationships with supported commanders and engender trust. 4. From the middle of the war onwards corps became the primary level for artillery command, with control of firepower devolved to the appropriate level. The British system was to move firepower not fire units. This system was characterised by the maxim 'command at the highest level, control at the lowest level'. The important result was that command and control were separated and a commander did not need to command artillery to have its firepower available. The principle of 'Unity of Effort' and not 'Unity of Command' enabled effective control of artillery mobile firepower and its use across formation boundaries. 5. Quick fire plans by BCs and FOOs emerged as one of the distinctive tactics of the British artillery system, and remain so to this day. 6. There was an effective CB system, but the weaknesses of German and Japanese artillery meant that it was seldom fully stretched. Hostile mortars, however, remained a problem. 7. Gunnery drills and procedures were well designed and standardised in detail to facilitate speed and error prevention, with options to enable tactical flexibility. 8. The artillery doctrine and practices were sound, able to exploit changes in technology and adapt to the conditions of different theatres. 9. Large batteries, the 8 gun battery was unique among combatants. "According to Marshal Zhukov, it was only in 1945 that the Russians, who consider themselves the most accomplished of artillerymen, even thought of attempting to coordinate movement with fire: their techniques were roughly equivalent to the British methods of 1915-6. The American artillery was admirable, well-organized and with the best equipment on the whole of any; but it was slow, prone to indulge in 'artillery preparation' of the type the British gave up after the Somme and Third Ypres, and all decisions to engage even at battery level were referred back to command posts far in the rear and out of sight of the battle. The British system, so simple, so obvious, so flexible and which had taken so long to be accepted rested on (1) reserve of control at a high level, like the Americans; but (2) off-setting this with intimate trust and liaison at each level of command: no one was ever denied fire when he wanted it as a result of centralization; (3) concentration of fire; (4) giving the right to take decisions to the man at the front; (5) an obsession with speed in reply to calls for fire; and above all (6), on maintaining an elaborate system of radio communications linking every user, every agency, and every battery together.'" The most experienced allied divisional commander of WW2, the New Zealander Lt Gen Freyberg VC (he commanded 2nd NZ Div from 1940 to 1945 apart from two brief periods when he commanded ad hoc NZ headquartered corps), regarded the Royal Artillery as the best trained and best led part of the British Army. From the 1920's onwards British commanders realised that they had to avoid casualties on the scale of WW1. This meant using firepower and artillery was the primary source of it. The low number of casualties in the British Army, compared to WW1, indicates that this goal was generally achieved. The British artillery in France in 1940 was technically competent but the 12 gun battery was unproven and proved unsatisfactory. However, the BEF was less than 10% of the allied forces and unprepared for German tactics and operational tempo. They were also suffering from the effects of the armoured protagonists in the 1930's, who had deprecated the need for artillery and encouraged the idea that manoeuvre was more important than firepower. See the 'WW2 Fire Control' page. Things went wrong in North Africa from early 1941 until the arrival of General Montgomery in 1942. In essence, poor tactics meant proven artillery principles and doctrine were mostly ignored, most notably artillery elements were distributed and placed under command of 'supported' units, which contravened the principle of concentration from an artillery perspective. However, there were extenuating circumstances, the British were still short of artillery, particularly medium and heavy, and their insufficiently powerful anti-tank guns left little choice but to use field guns for direct fire anti-tank. Montgomery, whose 1940 experience as a divisional commander convinced him that artillery concentrations were a key to success in fighting Germans, directed CRAs to have centralized command and control of their divisional artilleries and to use them as 72 gun batteries. However, this should not be taken too literally and efficient control procedures for concentrations were still some months away. Observers still ordered fire appropriate to the target but the need for concentrations was recognised and became customary. Predicted fire was insufficiently accurate and was exacerbated by longer ranges to targets than in WW1. The main causes were stale meteor data, inadequate meteor data for longer range fire due to primitive methods used by RAF meteorological detachments, target location errors from inaccurate maps, and mixed batches and many types of propellant that invalidated calibrated MVs. In NW Europe 1944-5 the high casualty rates among infantry commanders (around 30% per month for battalion, company and platoon commanders, of whom about 1/3 died) meant that battalions had difficulty maintaining their expertise, particularly in using the covering fire provided by a barrage and directing fire via a FOO. The 2nd NZ Division, often considered the best allied division in Italy, maintained their expertise and were masters in using barrages effectively. Having only two observers for four companies meant that FOOs had to keep moving around, and moving around increased casualties. In Burma it was a serious problem only solved by detaching men from the gun position and subsequently providing greatly increased observation resources. Medium and heavy batteries had observers, who normally operated as OPOs for their own batteries. Towards the end of the war and immediately afterwards there was criticism that too much fire was used and that concentrations were unnecessarily large. The operational research evidence suggests that the former was not so, although it depended on what effect was wanted, and barrages were undoubtedly wasteful of ammunition. That concentrations were too large may be true, although it can be argued that it probably saved lives and was therefore justifiable. Change and continuity characterised the 25 years after WW2, with the Royal Artillery in action in Korea, Malaya, Kenya, Suez, Radfan, Brunei and Borneo. In 1950 Target Grid Corrections were adopted for ranging. This meant that corrections were ordered as distances around the line observer-target (OT), Left or Right to get ranging shells onto OT, then Add and Drop to bracket the target. GT or any arbitrary line could also be used if required. Observers no longer ordered a BT range and switch, the CP converted corrections into new firing data. Then in 1956 ‘real’ grid bearings replaced zero lines and switches, and 'battery centre' replaced the pivot gun for calculating firing data. In the decade following WW2 various improvements to technical procedures and equipment were introduced. See the Fire Control 1945-69 page. Post WW2 analysis showed that predicted fire lacked accuracy and various actions were undertaken to improve it. Most notably an improved correction of the moment graph, better charge temperature measurement, reduced variety of propellant, revised calibration procedures and improved CP processes for producing firing data. This improvement process continued with the first MV measuring radar appearing in the 1960s to the late 1980's when one was fitted to every gun. Survey also improved with every battery receiving a gyroscopic orienter in the mid 1960's and a full inertial 'position and azimuth determining device' around 1980. Quick fire plan procedures and processes were further evolved, and there were various other minor changes to some fire control procedures and many refinements to drills. The term 'deliberate fire plan' was introduced for the traditional and slow type, barrages remained 'on the books' for a couple of decades but were never practised. Additional control terminology was introduced, adding 'direct support' and 'at priority call' to 'in support'. After the war there was argument about the replacement of the 25-pdr. The war in Europe led one side in this argument to seek a smaller calibre gun since neutralisation was the need and a smaller gun meant a smaller safe distance, which meant less exposure time for attacking troops when fire lifted. Those from the Far East wanted bigger calibres for destroying bunkers. In the event an 88-mm 20-pdr was developed (capable of firing 25-pr ammunition. However, NATO had standardised on 105-mm as the smallest calibre, and in any case NATO was defensive. Offensive operations were out of fashion so casualties and damage, not neutralising, capabilities were required. Larger calibres also offered greater range, which was required for concentrations as battlefield density decreased. Mils were increasingly used for angular measurement with new equipment, and in the late 1950's they were adopted throughout the army (except aircraft compasses) to replace degrees and minutes. During the mid 1960's 25-pdr and 5.5-inch were converted to mils, which divided a circle into 6400 mils instead of 4320 divisions of 5 minutes, slightly improving precision at longer ranges. For more information about post-war fire control developments see the 'Fire Control 1945 - 1969' and 'Fire Control in the Computer Age' pages. The 20th Century Fire Control part of this site also describes the post war developments on the 'Maps and Survey', 'Ballistics and Data', 'Calibration' and 'Meteor' pages. Predicted data was produced for all targets, although ranged ones were still ordered as a 6-figure map reference (ie nearest 100 yards/metres). In some campaigns of the 1950's and '60's light anti-aircraft gunners manned sections of 4.2-inch mortars in various active theatres, although these had equipped light batteries, most notably in Korea. Although they were available British observers had rarely used anything more that hand held binoculars as observation aids. However, they were early adopters of more advanced devices for every observer: radar (GS No 14) (1975), laser range finder and night observation device (large image intensifier) (1976), position and azimuth determining system (inertial navigator) (1981), thermal imagers (1990). Observers (but not BCs) affiliated to armoured regiments were equipped with tanks (Centurion Mk12) until 1979. However, the WW2 mismatch in the number of observers in a battery and the companies/squadrons continued, although TA observation batteries were formed to provide a third OP/FO party for most regular batteries and infantry battalions had reduced to three rifle companies. In 1965 the Australia, UK, Canada, US (ABCA) common artillery procedures and terminology came into effect for calls for fire between observers and CPs, and subsequently became NATO procedures. This resulted in a complete change in terminology and some changes in procedures. Speed in answering calls for fire remained an obsession. In Korea the British, Canadian and New Zealand regiments of the Commonwealth division typically responded to Uniform targets in about 70 seconds. In about 1970 a US review team visited Vietnam and found US batteries generally took about five minutes from receiving a call for fire to firing the first round (battalion FDC centred procedures had be found impractical in Vietnam). They then visited the Australian and New Zealand batteries using British procedures, they had plotters, used full prediction, had gun rules for their 105-mm M2A2, and found them never taking more than 90 seconds to be ready to adjust fire, usually delayed by the need for air clearances. This was consistent with the training exercises in Europe by the national batteries of the Allied Command Europe Mobile Force. And in March 2003 a UK battery in Iraq reported taking 45 seconds from receiving a call for fire to the 'splash' of the adjusting shell, but a more interesting and historically consistent comparison was at Al Nasiriyah. A UK 105-mm battery under control of a US marine's FDC was reporting 'battery ready' on average 1.75 minutes after the call for fire, the US 155-mm batteries were averaging 8 minutes. Copyright © 2001 - 2016 Nigel F Evans. All Rights Reserved.